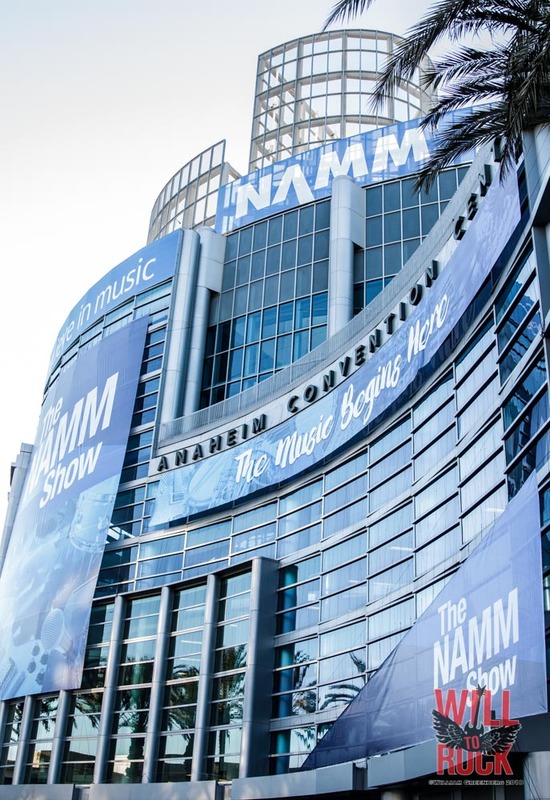 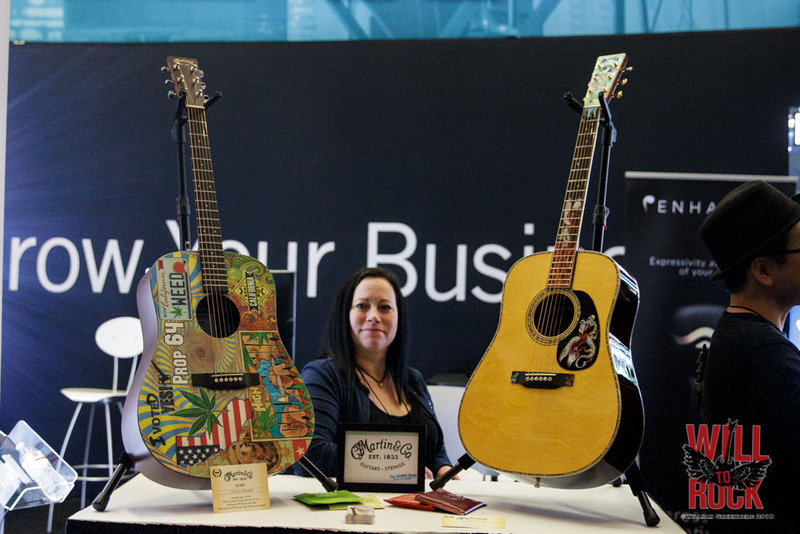 The National Association of Music Merchants (NAMM) made it’s way West to the Anaheim Convention Center for it’s annual Winter Convention. 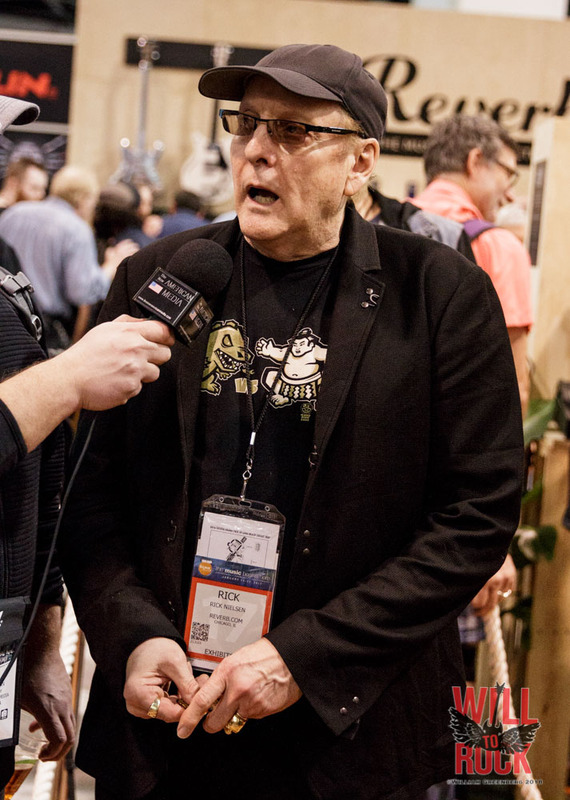 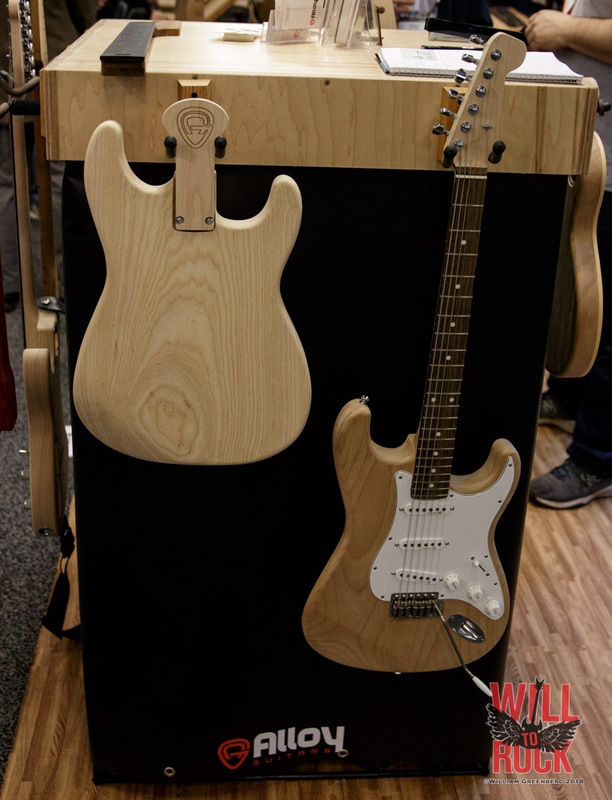 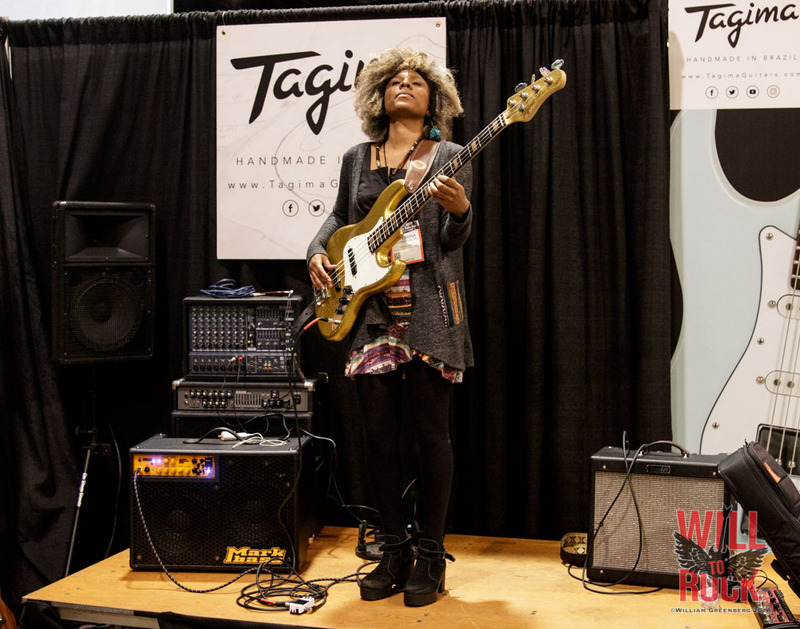 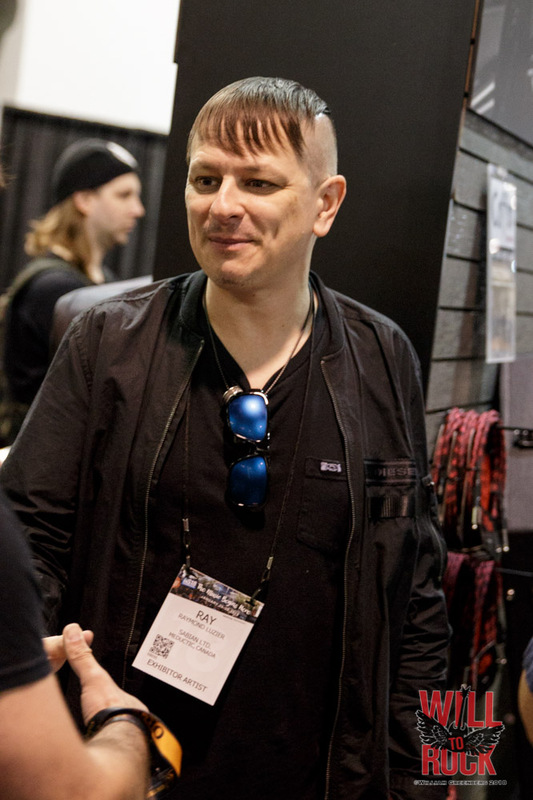 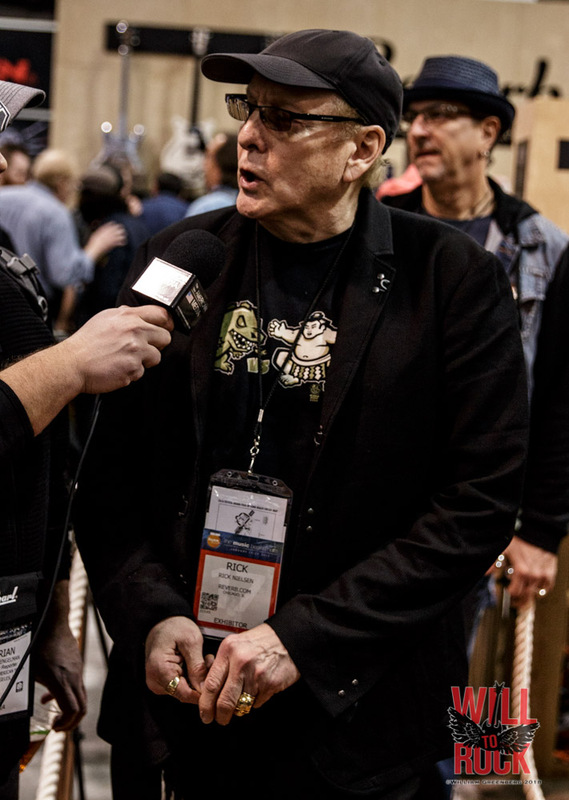 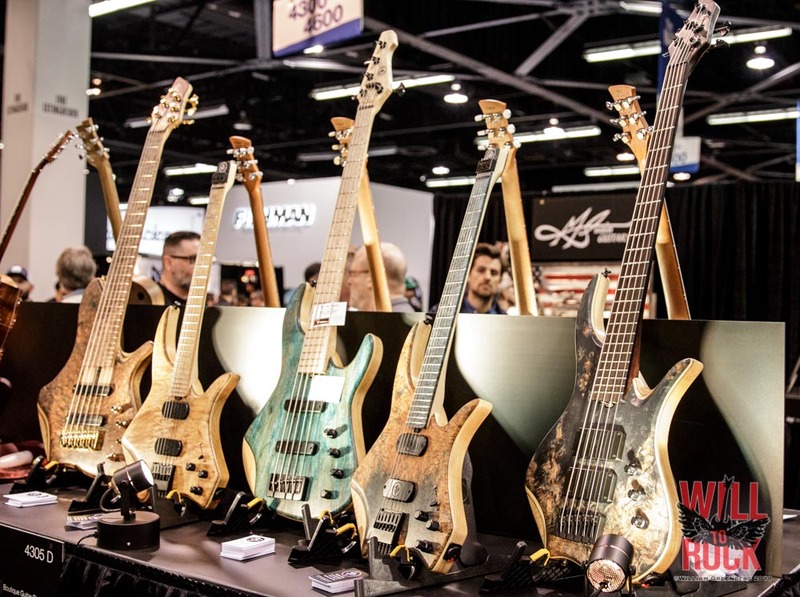 Surprisingly enough, this was my first trek to NAMM and to say I was overwhelmed would be an understatement. 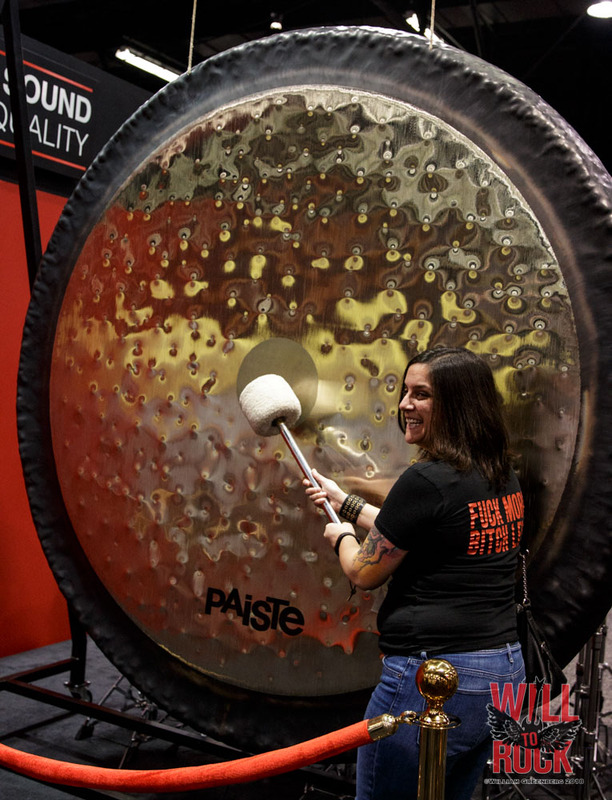 I knew it was big…I just didn’t know it was THIS big! 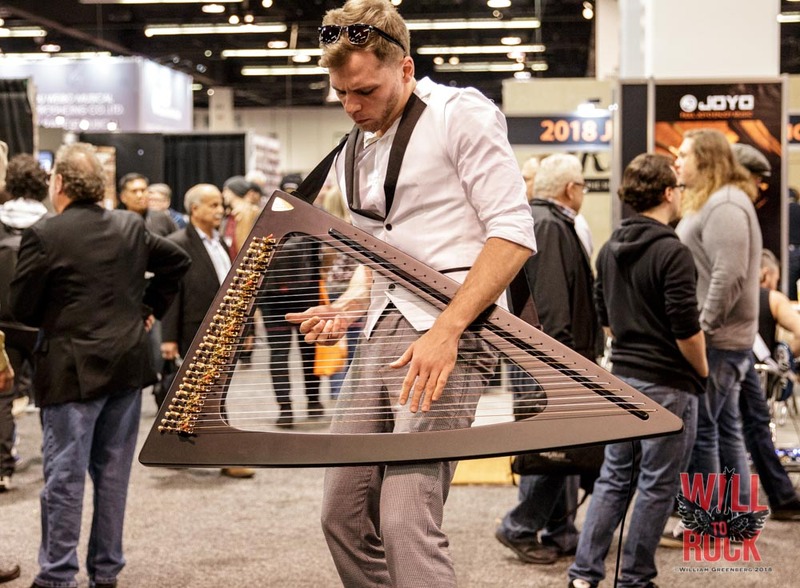 By no means did I get to see and do everything I wanted to. 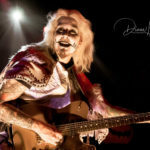 My trip was cut short to illness that I will forever blame on a Howard Johnson’s breakfast. 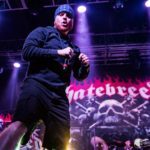 (They should be charged with attempted murder!) 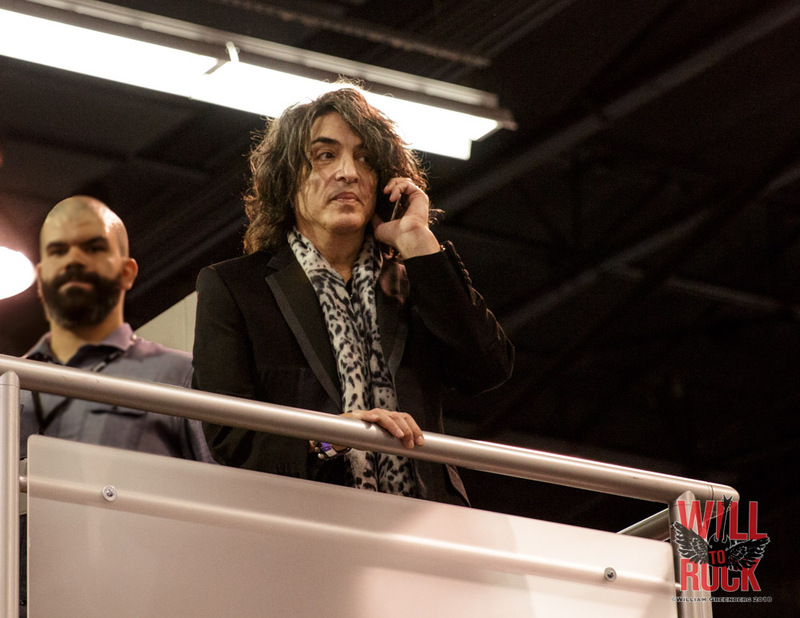 But who I saw and what I did see gave me some perspective as to how the whole shabang works. 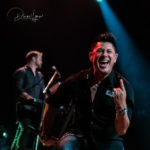 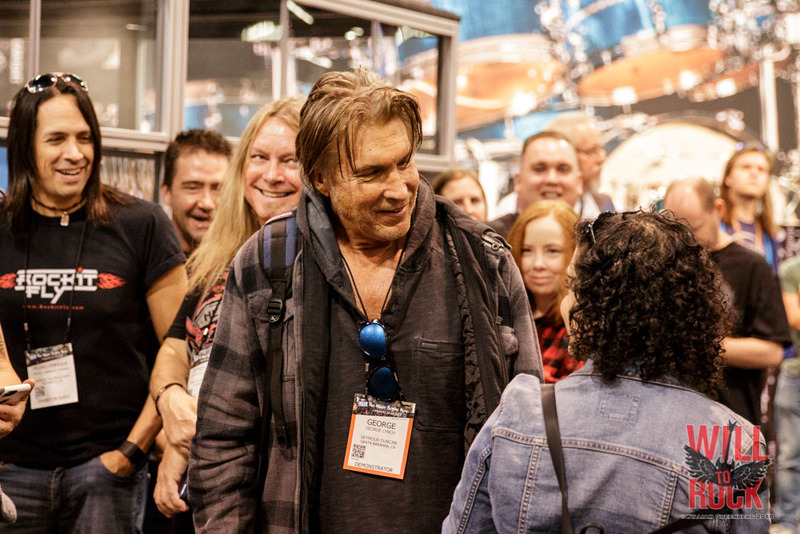 What I have compiled here are some of my highlights of the show along with some musings that I noted along the way…. 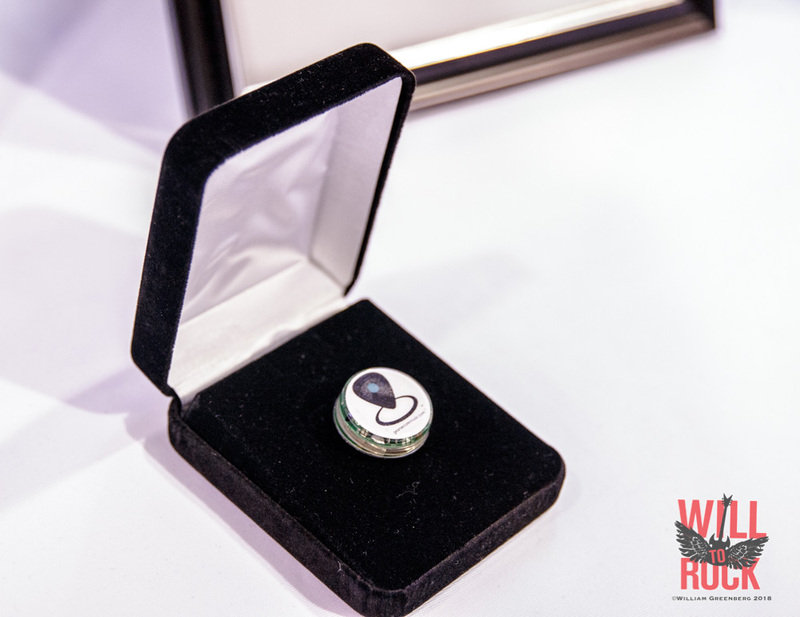 First and foremost…If you’re sick. 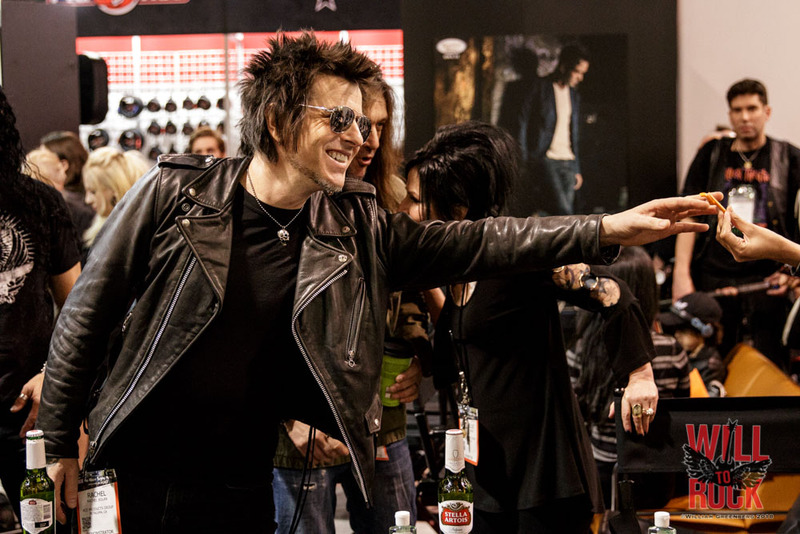 STAY AWAY!!!! 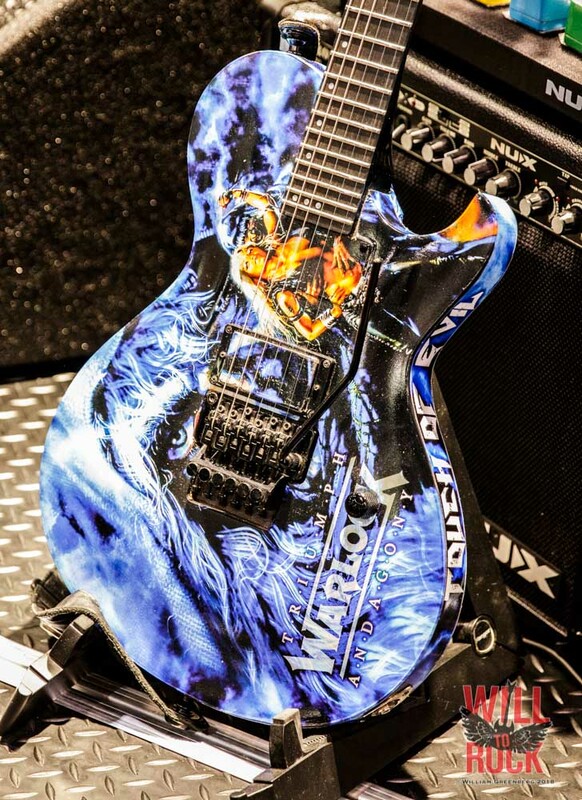 There’s a reason that “NAMMthrax” is a thing! 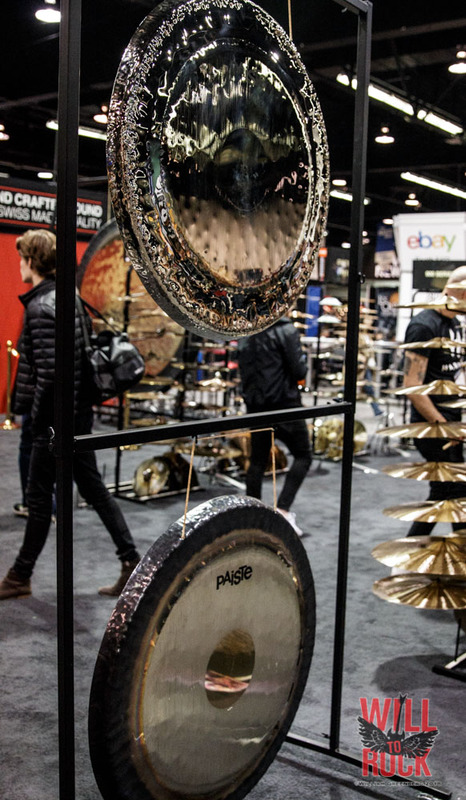 It’s 4-5 days of walking around in the world’s biggest petri dish. 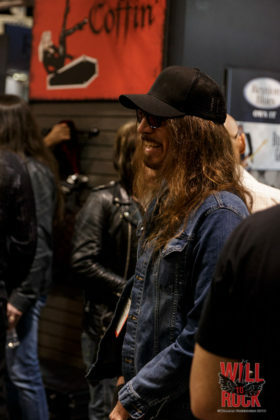 Some people had the courtesy to wear masks (Whether for their benefit or for others, it was appreciated). 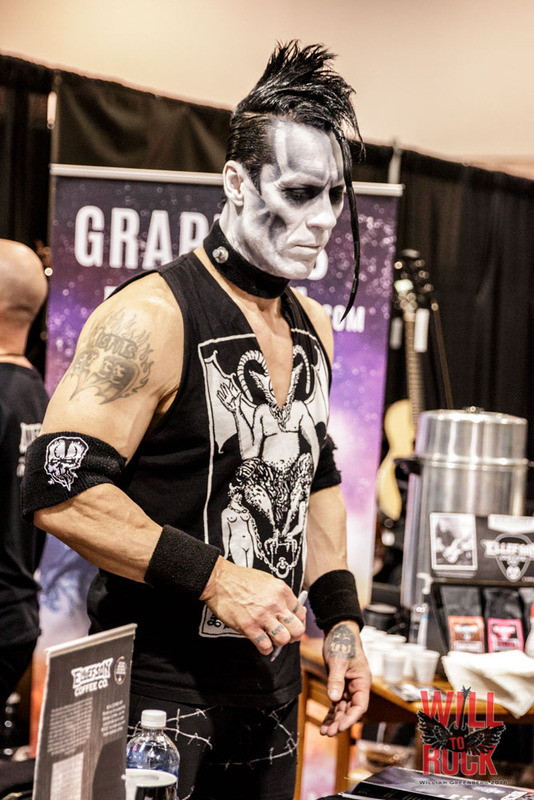 Special shout out to the lady who coughed into her hand as she was being introduced to me and then threw it out at me to shake. I have never gone through as much Purell in my life! 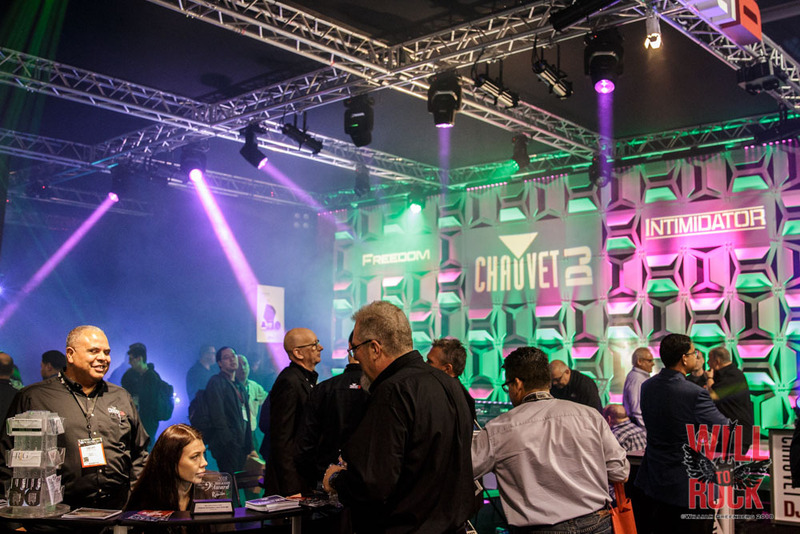 While people were setting up their booths and displays in the Main Halls, Media Day was held on the foyer and quite a few vendors took the time to set up a temporary spot for the afternoon. 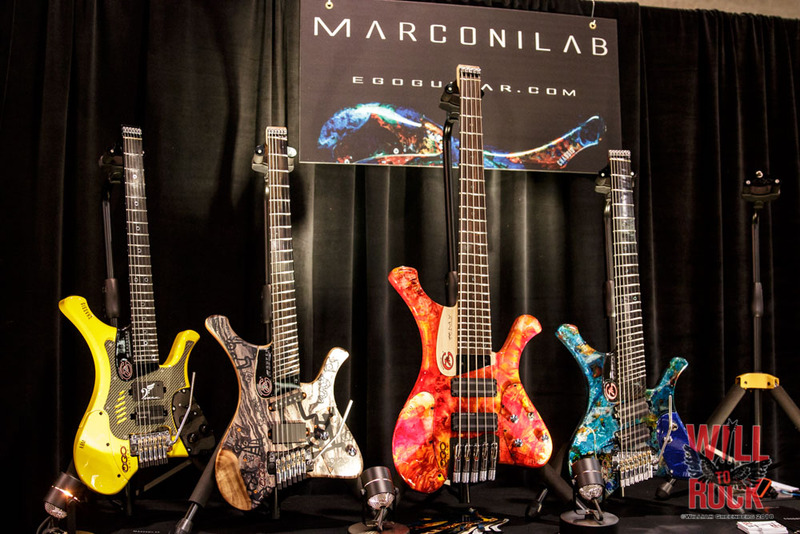 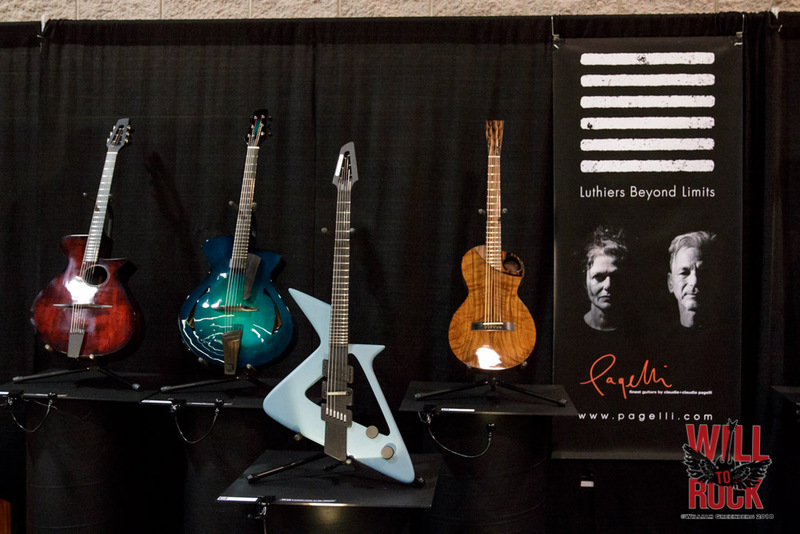 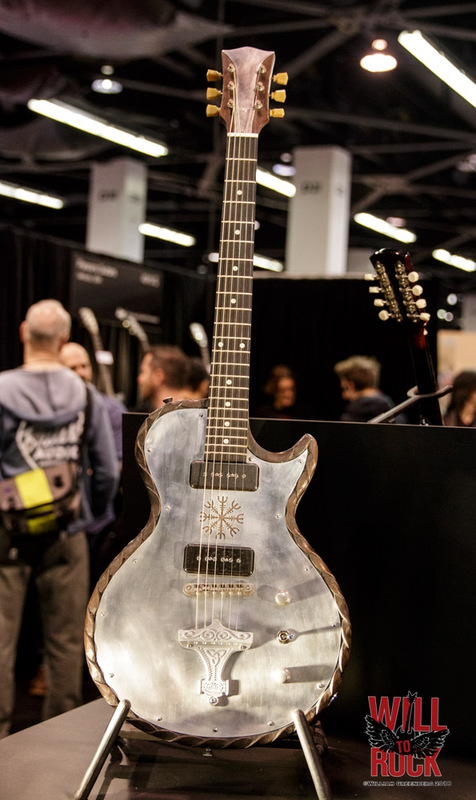 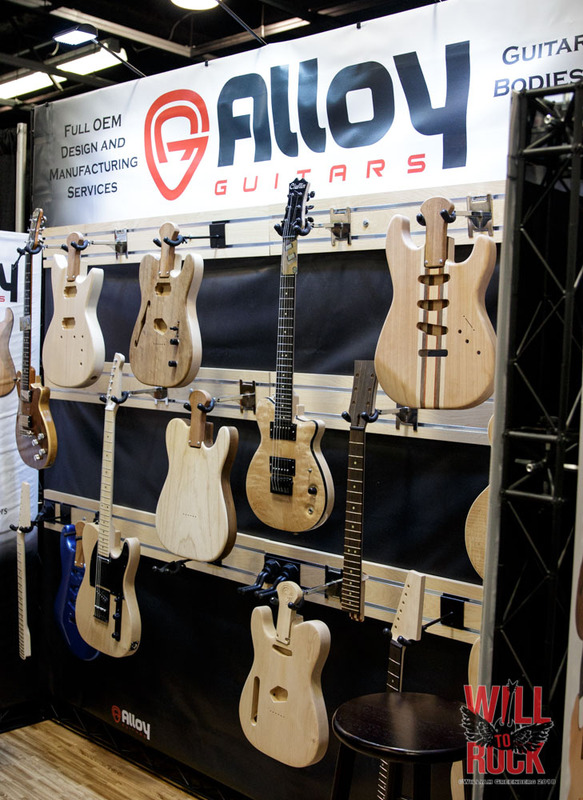 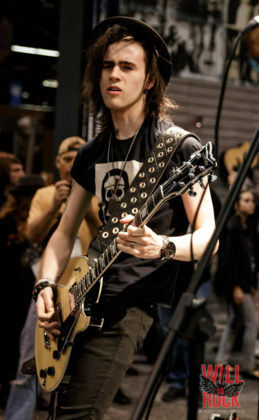 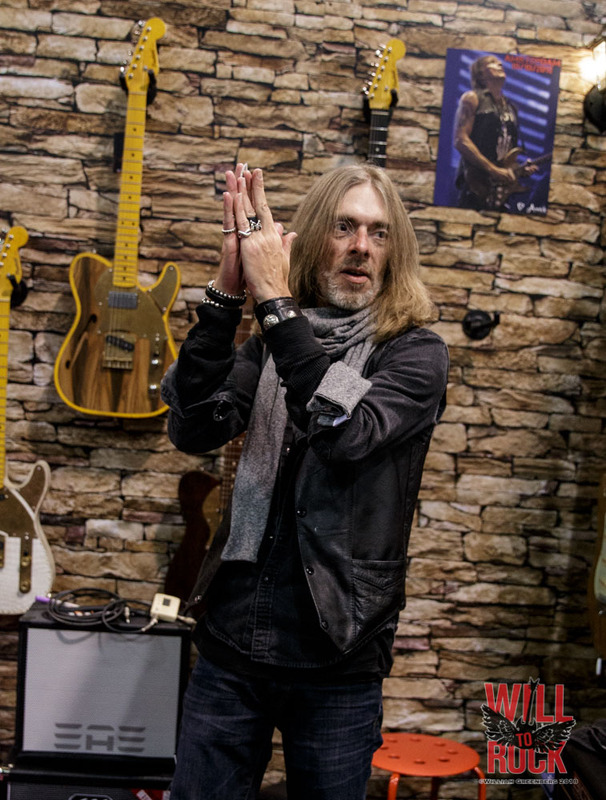 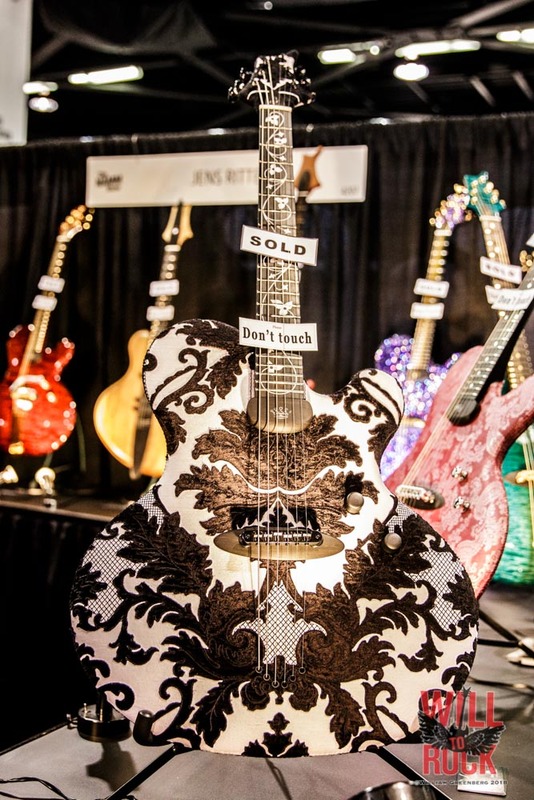 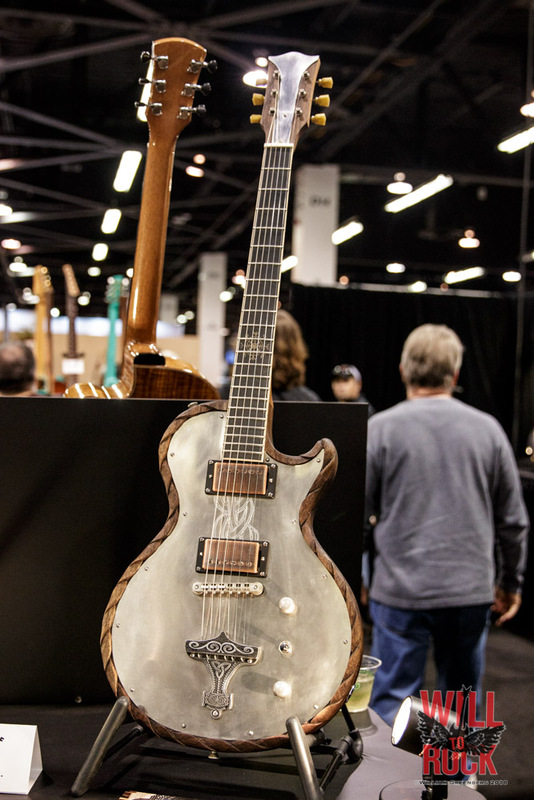 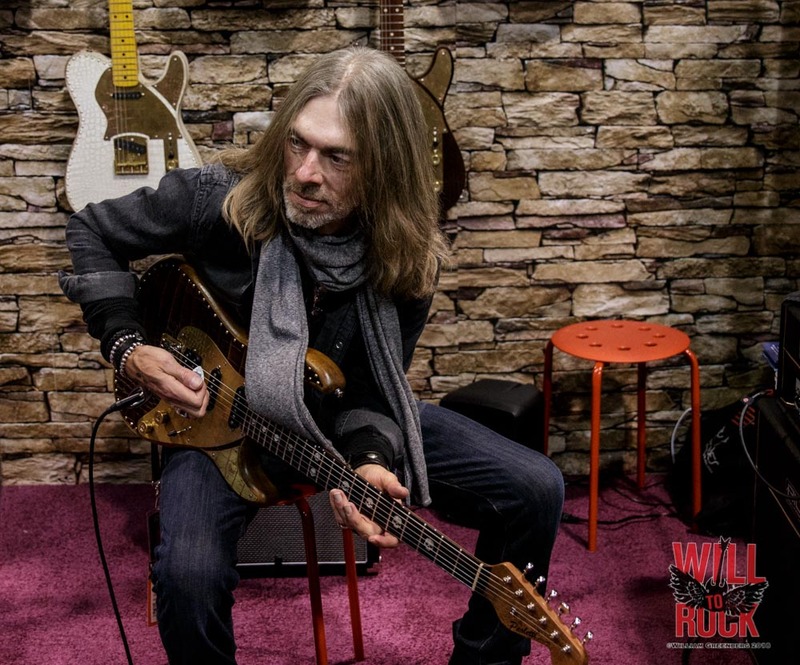 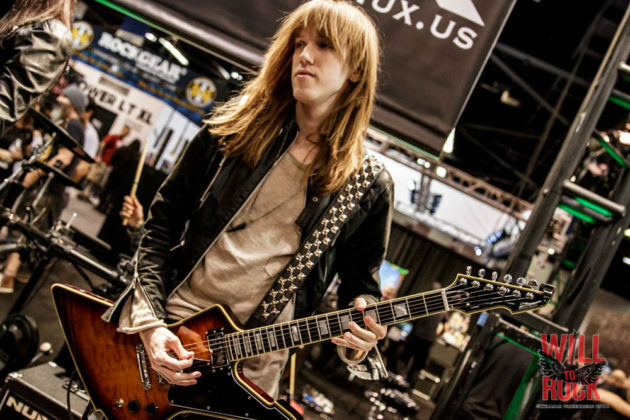 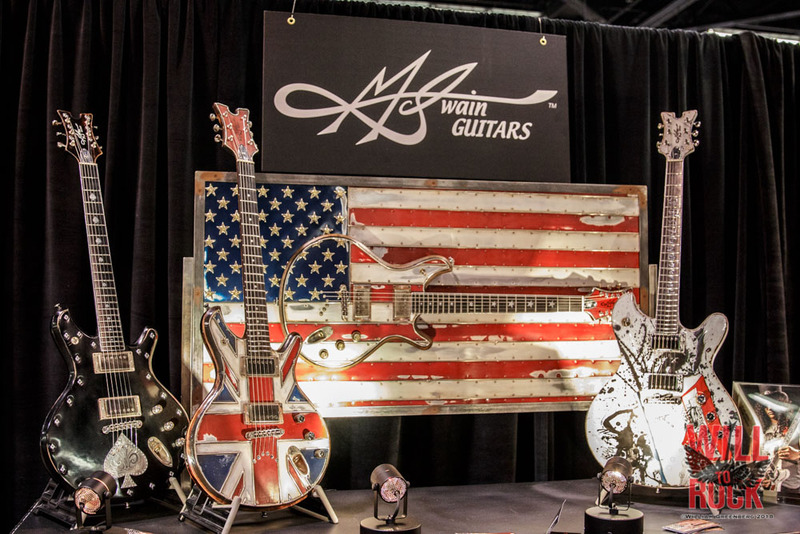 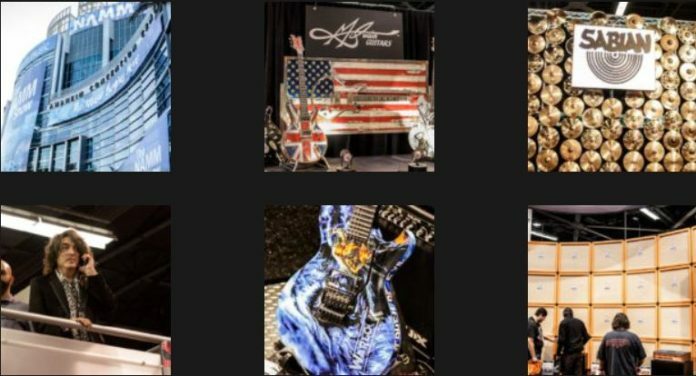 Checking out the “Boutique Guitars” was right up there with some of the best moments of NAMM. 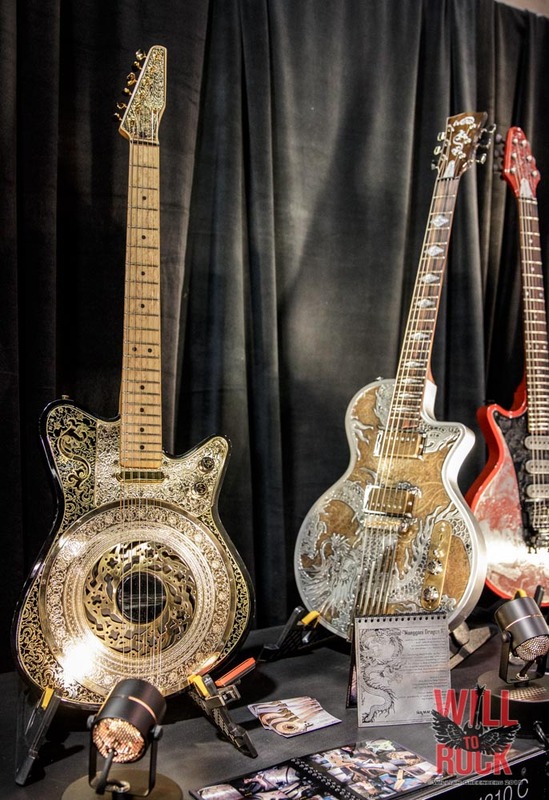 Not just beautiful to look at, these are finely crafted instruments. 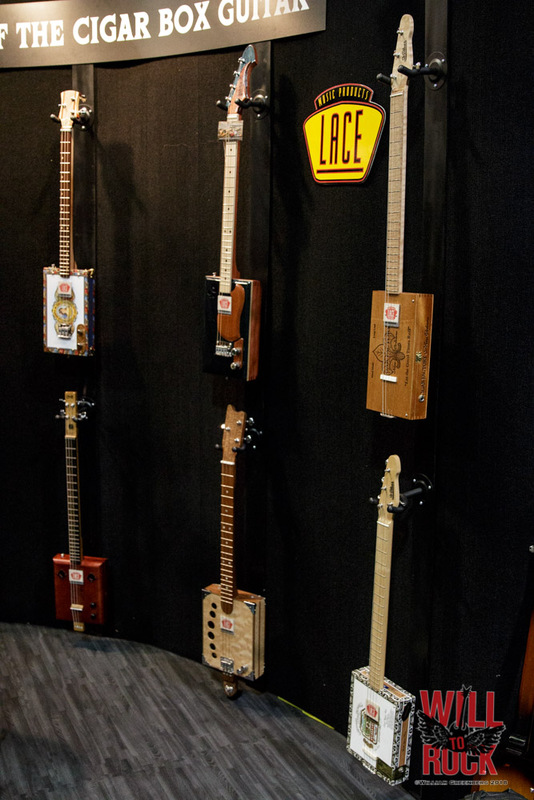 Collectors were lining up to grab some of these one-of-a-kind masterpieces. 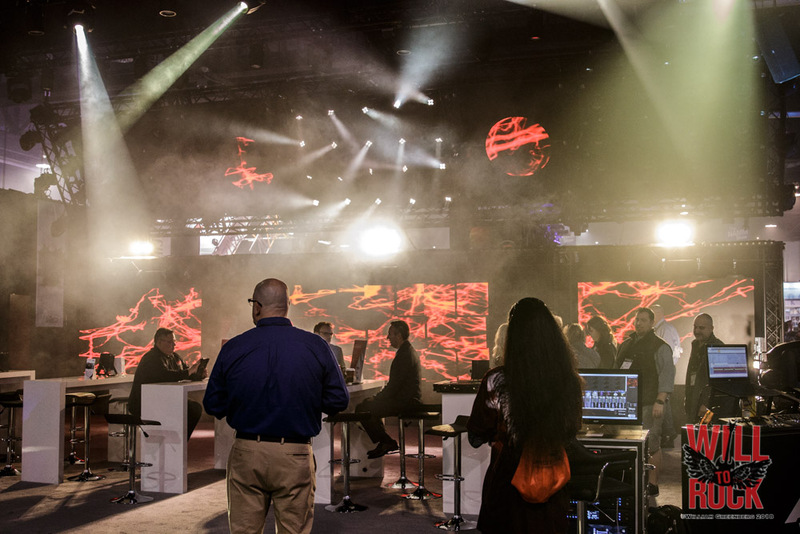 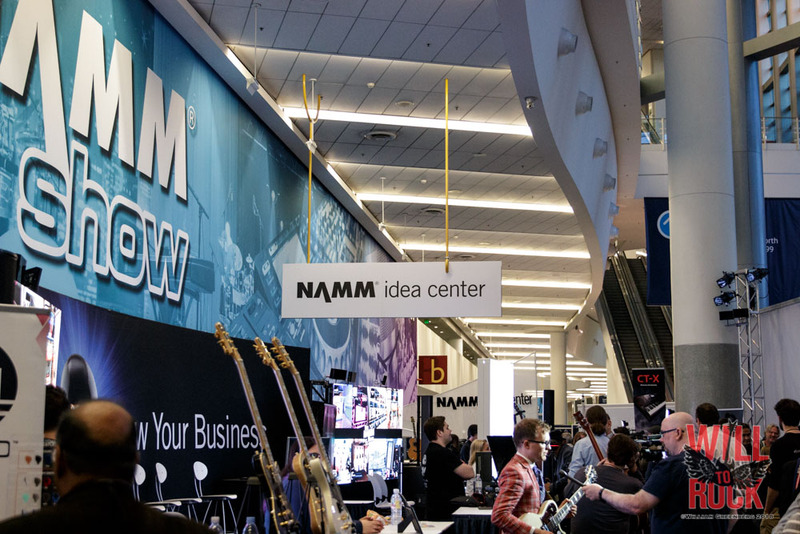 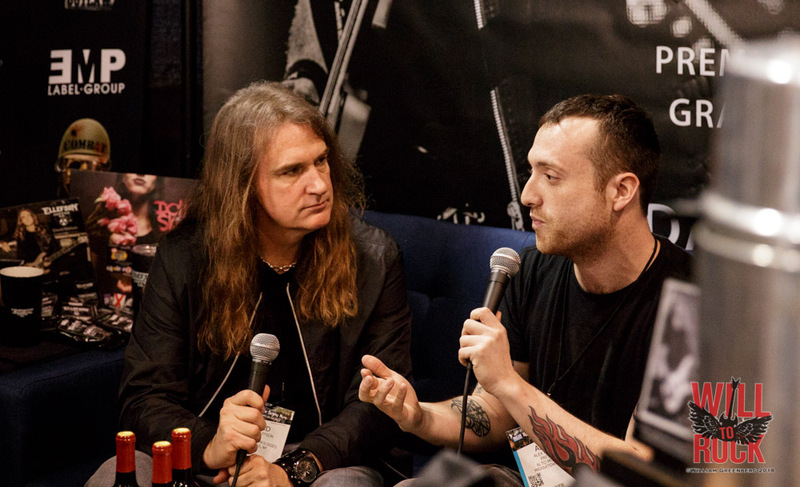 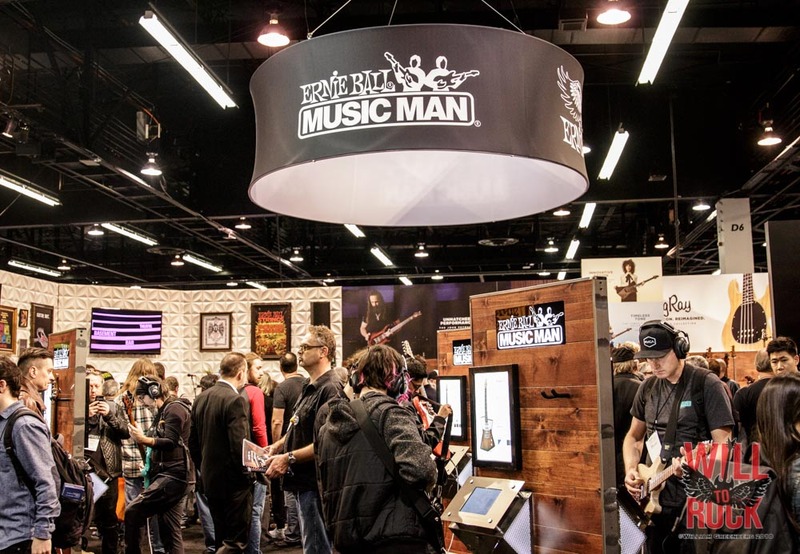 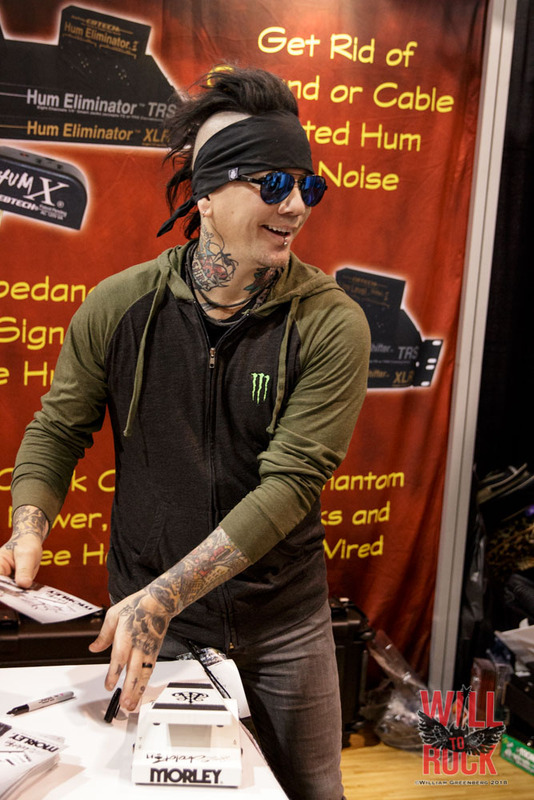 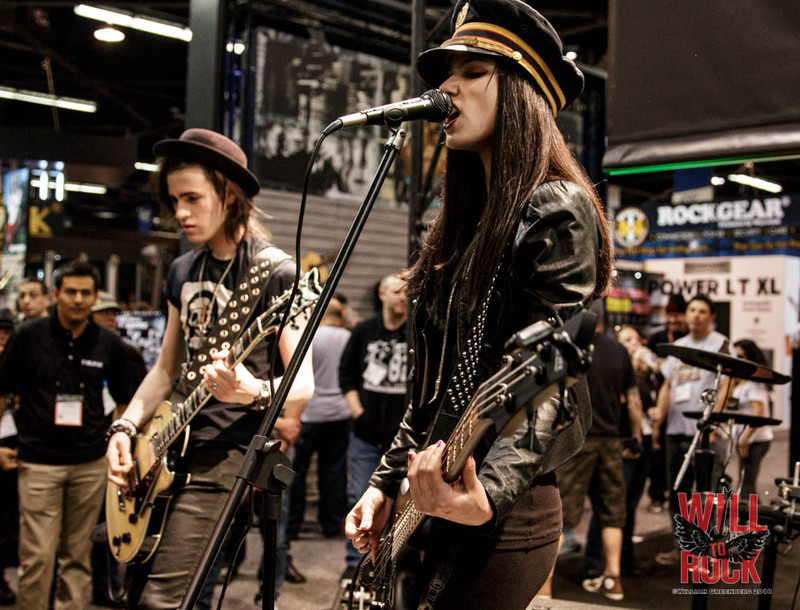 NAMM encompasses every aspect of the music industry. 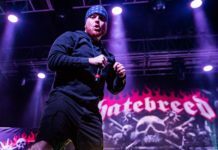 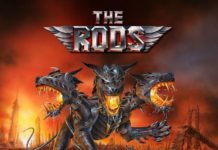 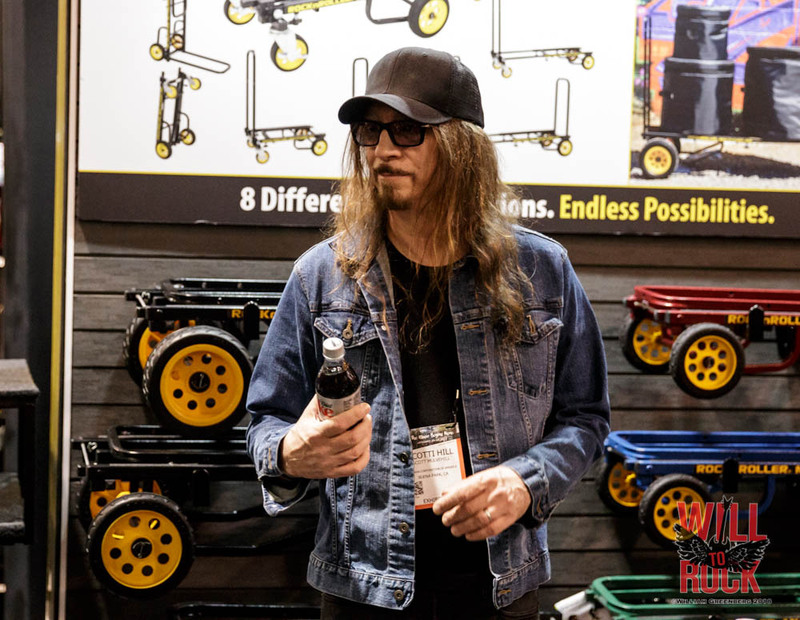 From the nuts and bolts holding together the instruments, to the lighting rigs and hydraulics that enhance live performances with everything in between covered. 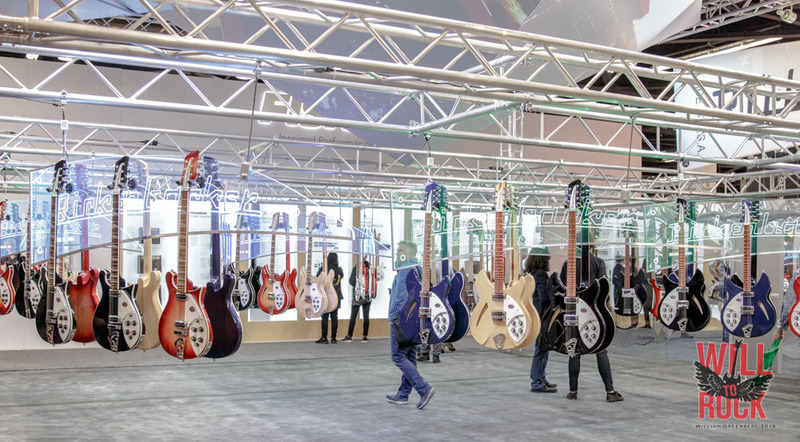 Walking around parts of the floor is akin to witnessing a night club breaking out into a full fledged festival while walking through the largest group of people in the middle of a sound check ever. 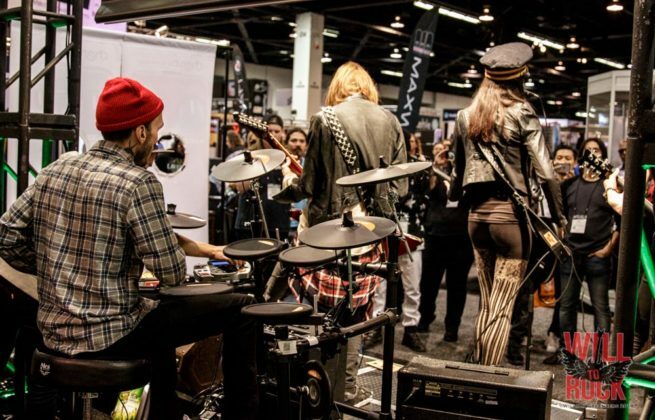 Instruments being demo’d, drums being pounded, amps being stretched to their limits (right before the NAMM police would show up to give a Decibel level warning). 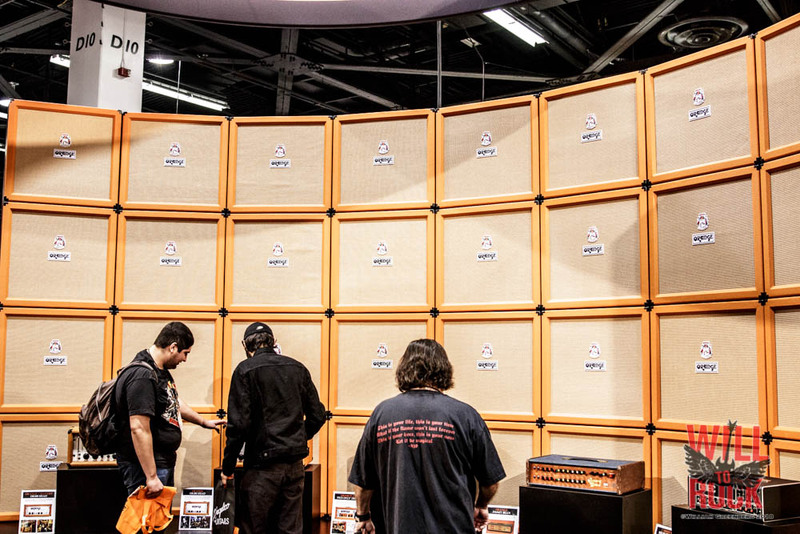 It is sensory overload turned up to 11. 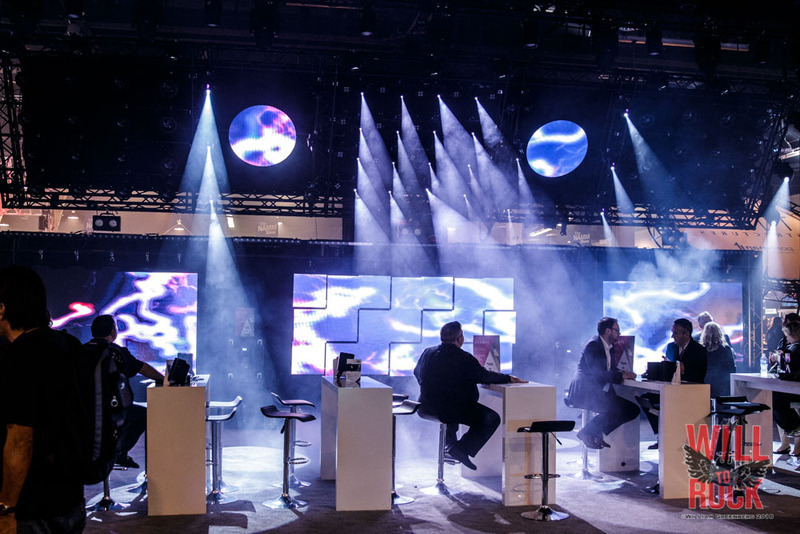 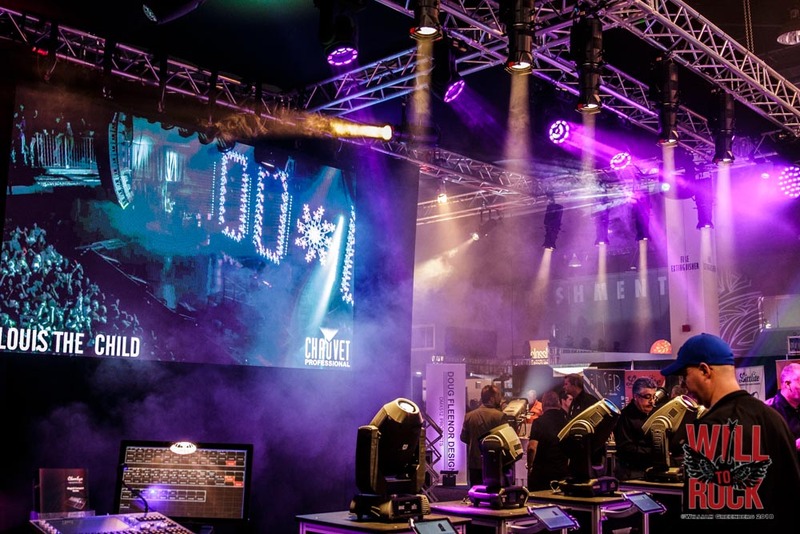 The displays varied from small corners to large showroom beacons. 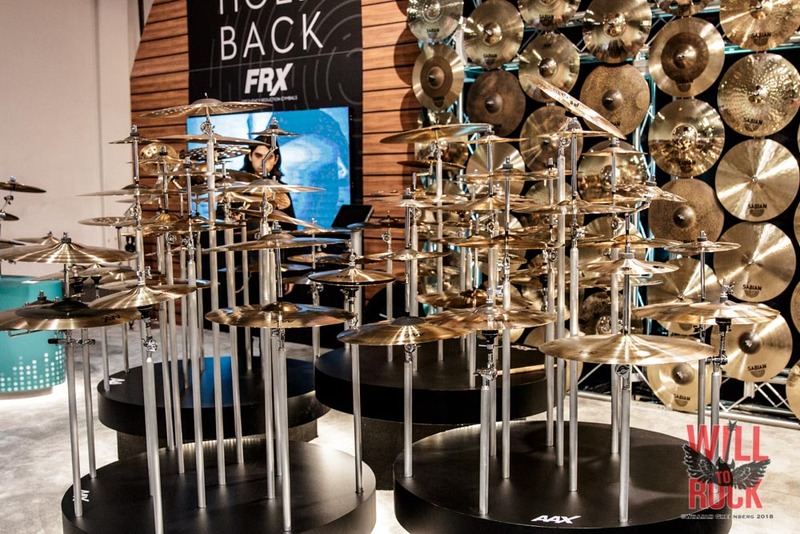 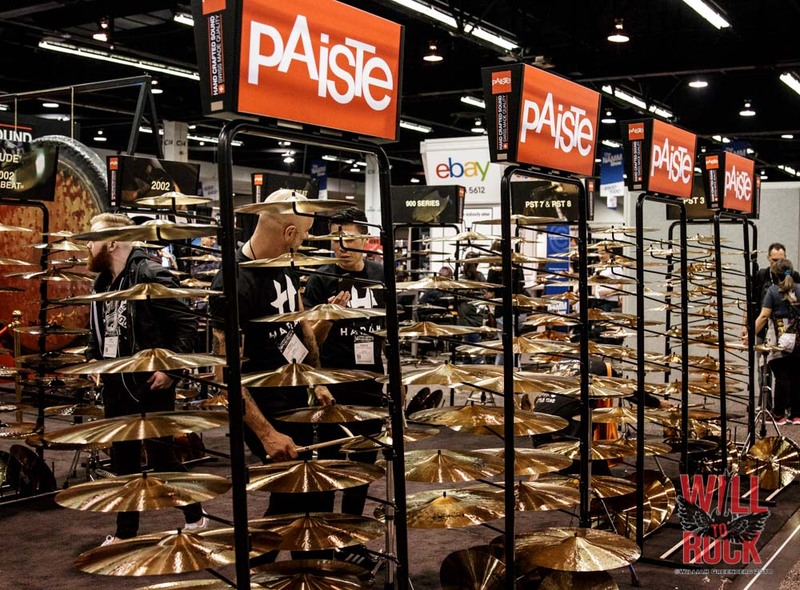 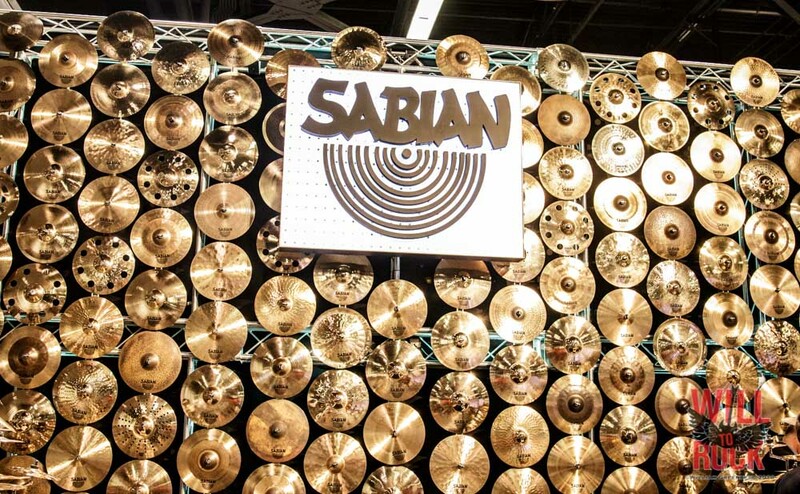 Obviously established vendors such as Sabian, Ibanez, Marshall etc…took up larger spaces, but it wasn’t always the size of the space you had, it’s what was done with that space. 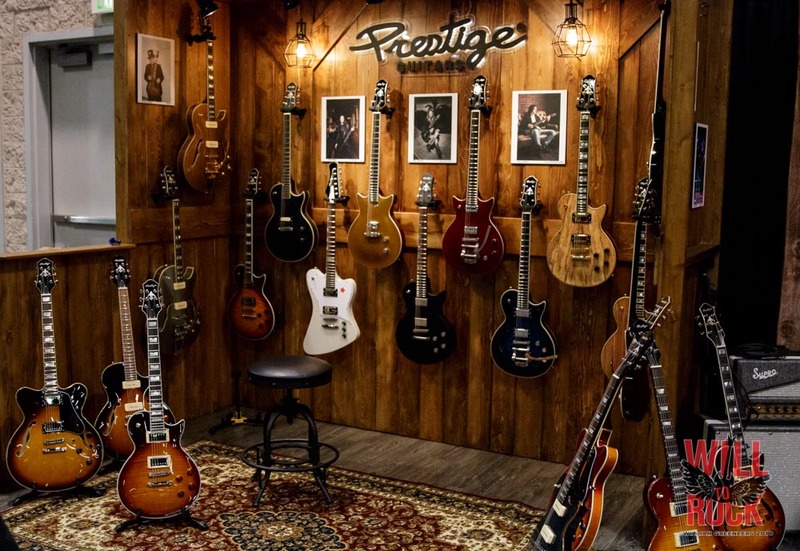 Prestige guitars, set up a very classy, “prestigious” display. 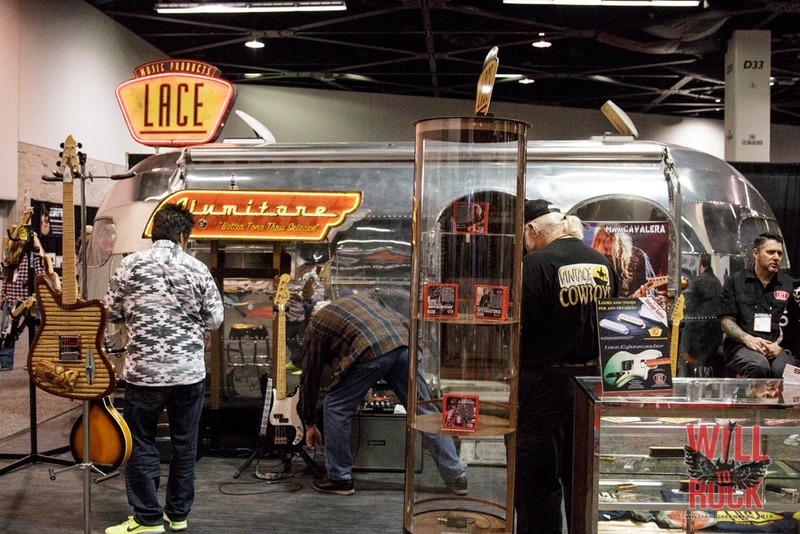 Lace utilized an Airstream to showcase their pickups. 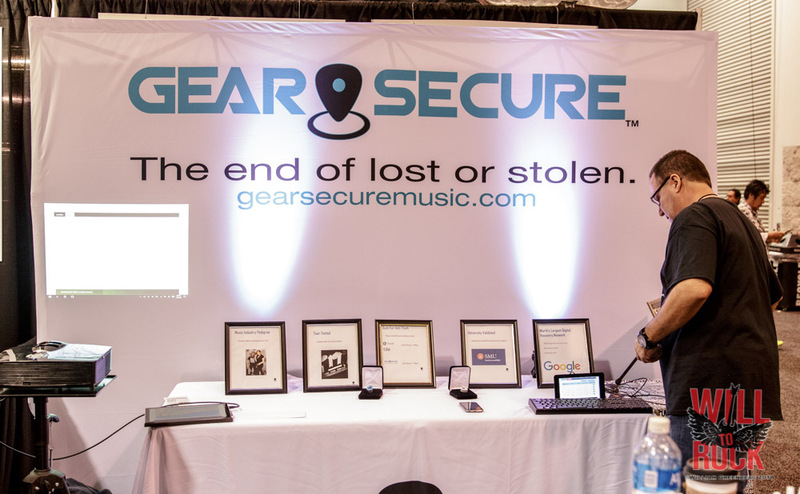 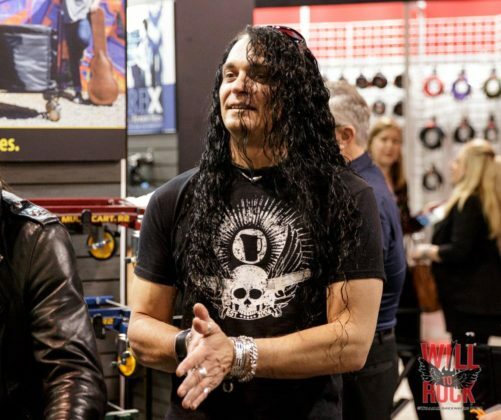 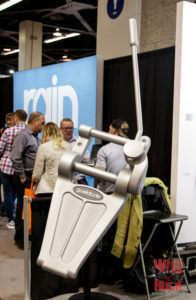 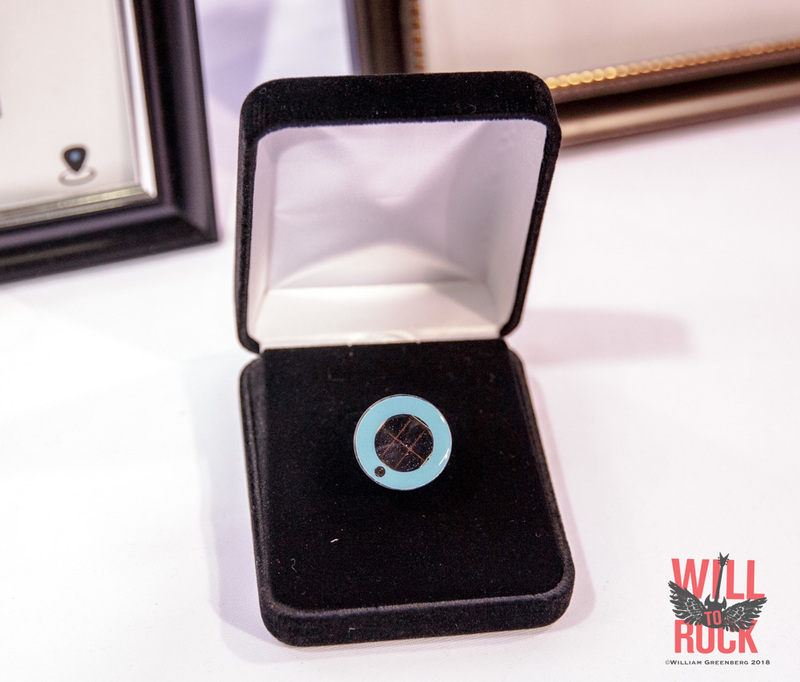 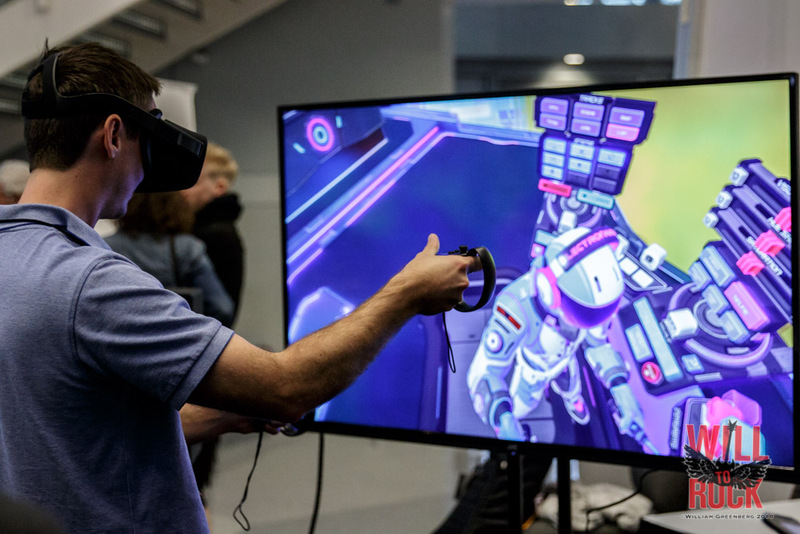 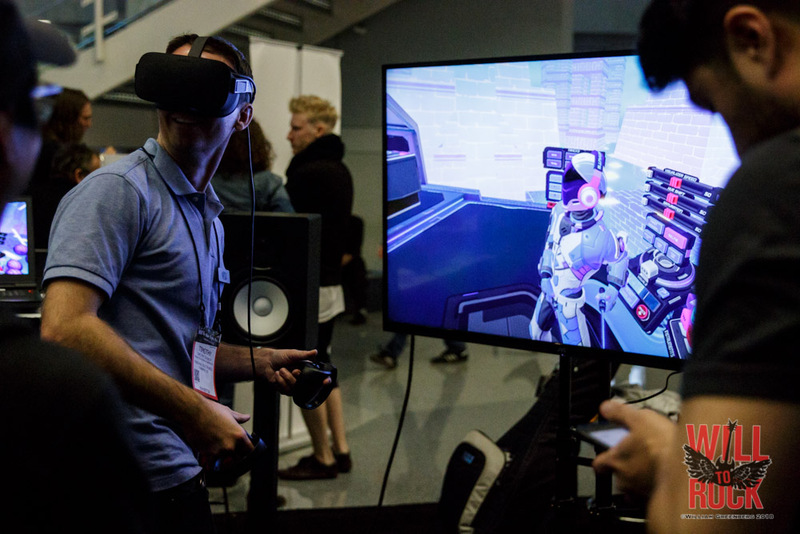 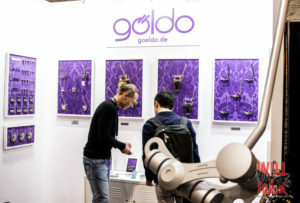 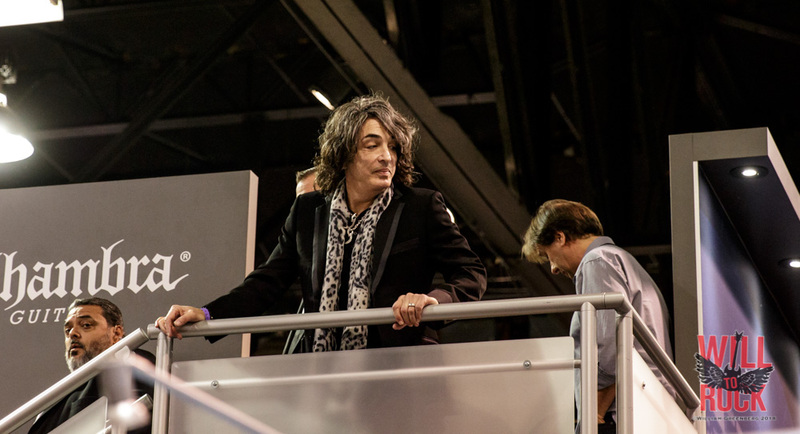 GearSecure, a company that has created a device that can be inserted into instruments (and other items) that can track their whereabouts via GPS, enlisted the help of several celebrities to drive traffic to their booth. 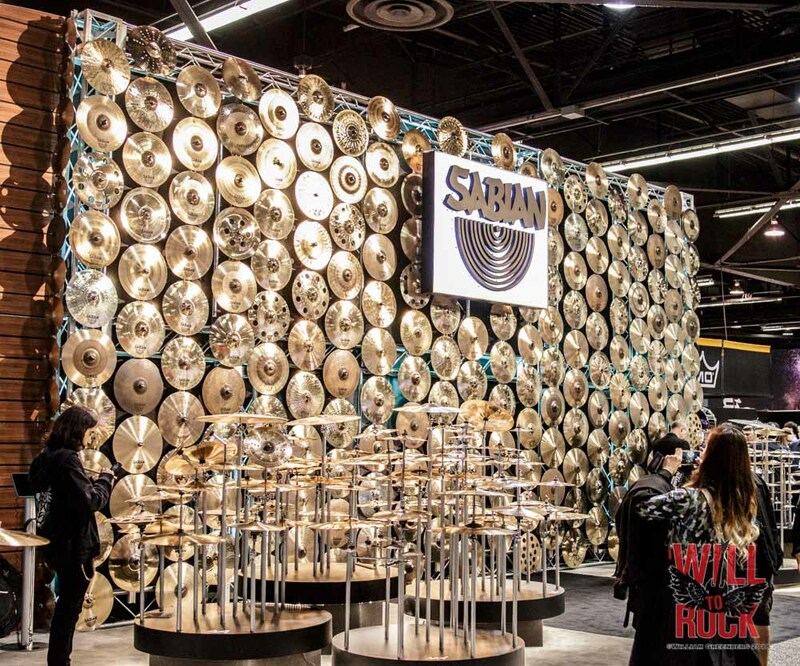 Some displays were a wee bit BIGGER…. 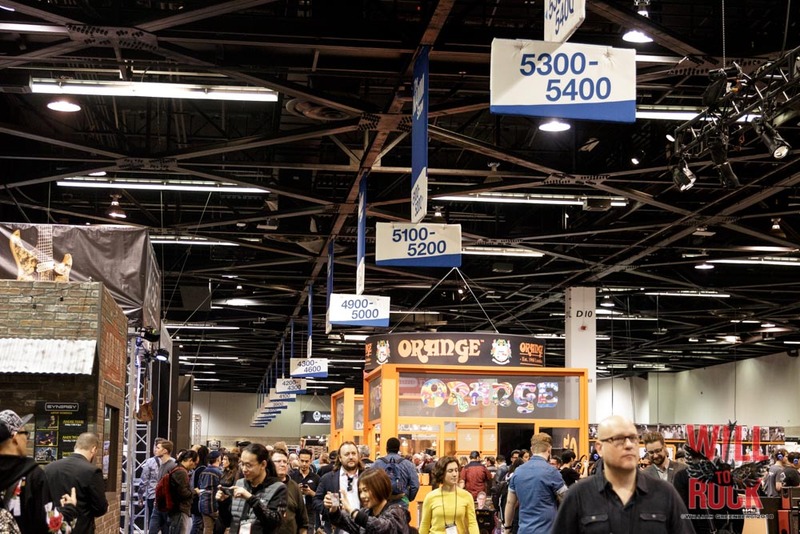 The British company, Orange Amps, created a wall of Orange and made sure they were seen all through the convention center by handing out bright “Orange” bags to everyone who wanted one. 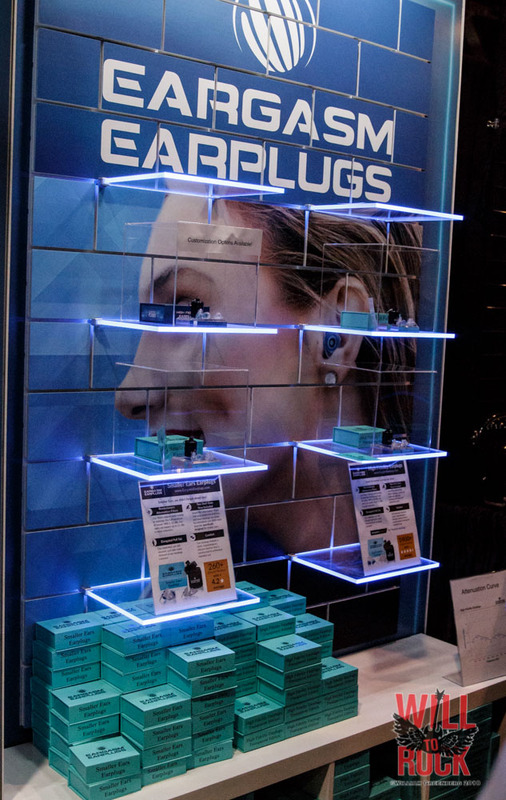 Eargasm Earplugs had a free daily giveaway that brought crowds to their little space. The constant demos were an amazing way to get up close and personal with some incredible musicians and products. 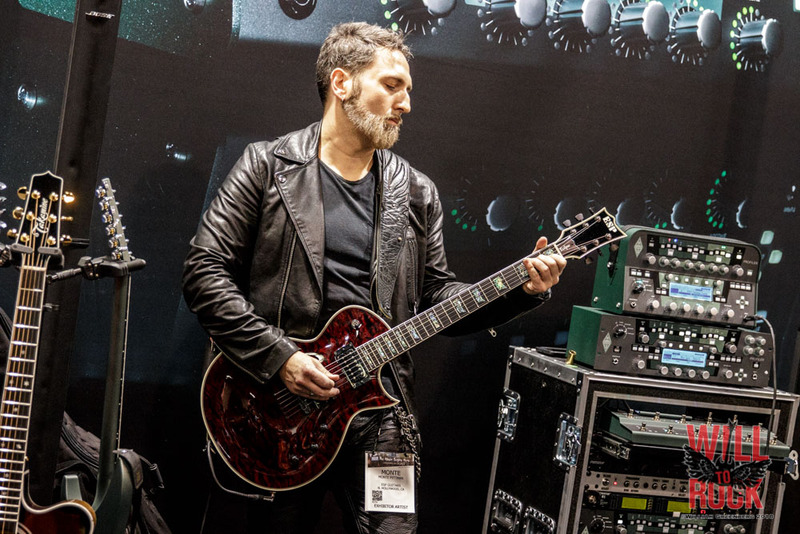 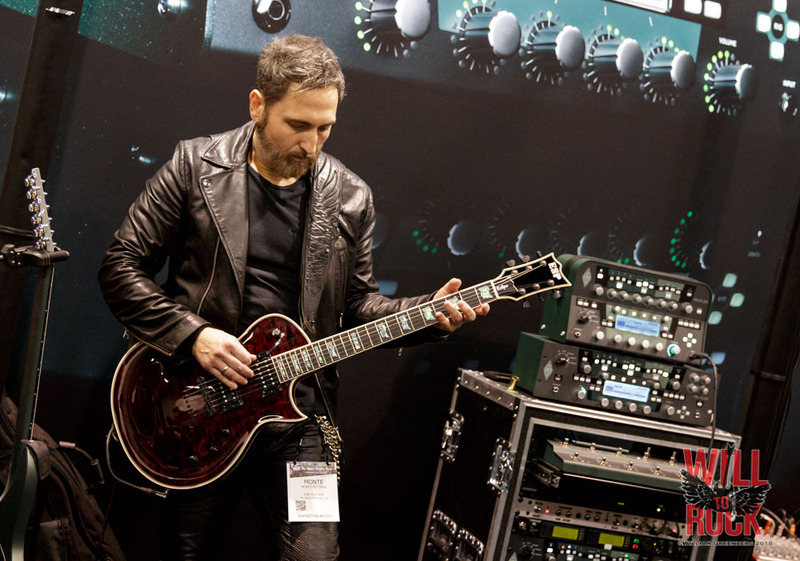 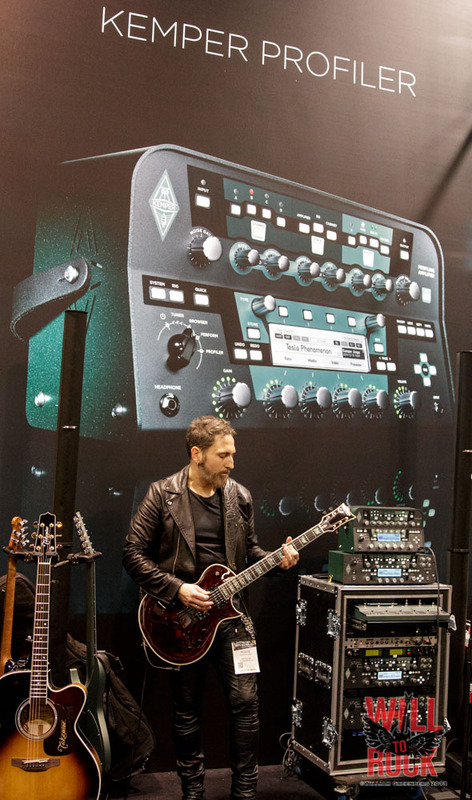 Guitarist Monte Pittman (Madonna, Prong) giving the Kemper Profiler (digital amplifier and effects processor) a test drive. Tommy Bolan (Warlock) had a stage-worthy shred-fest demonstrating the NUX looping effects pedals. 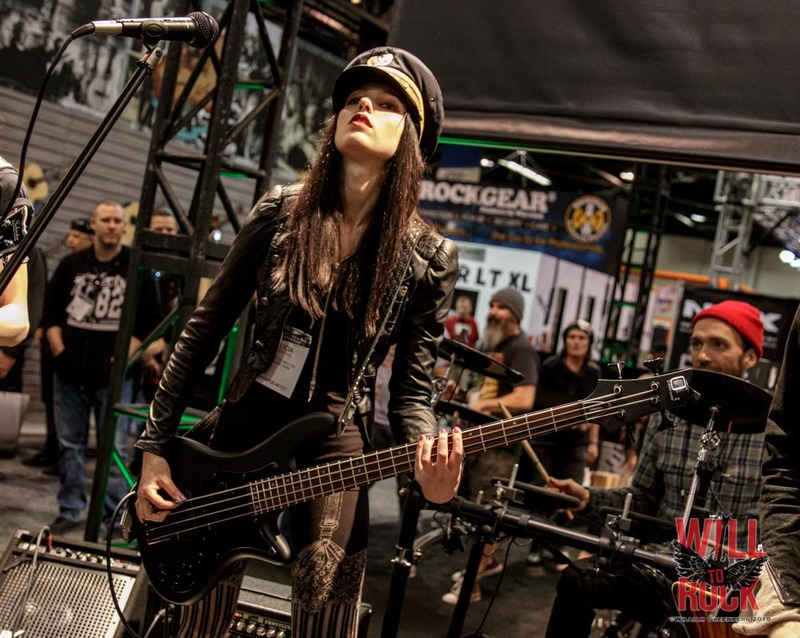 Vigil Of War, led by singer, bassist, Alicia Vigil followed Tommy to the Nux stage giving the crowd a mini concert. 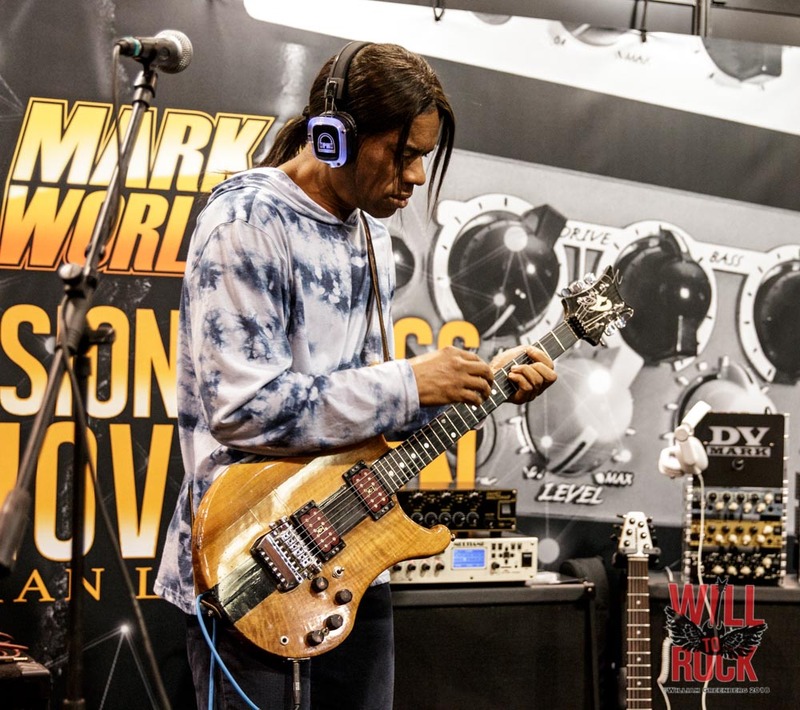 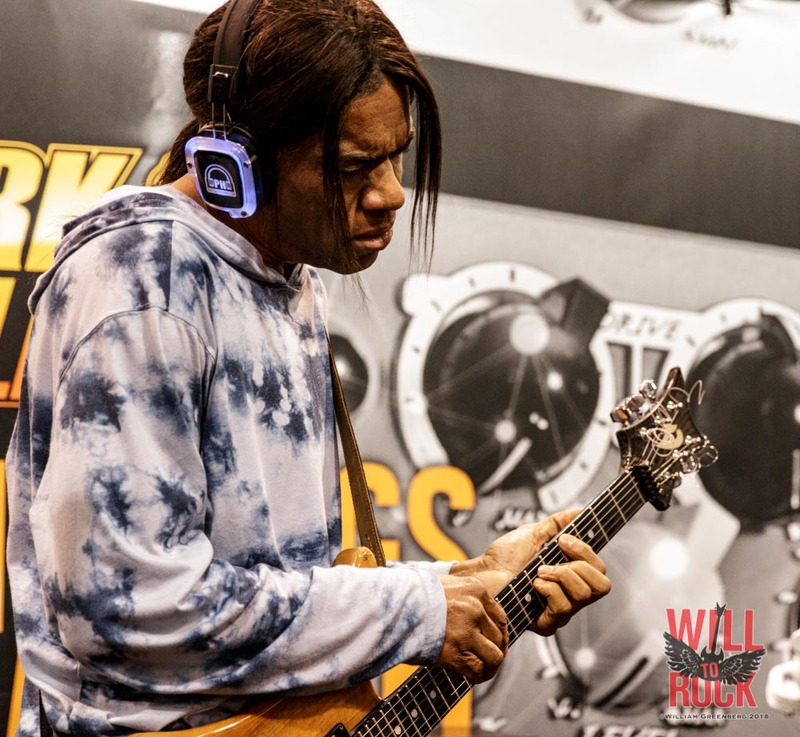 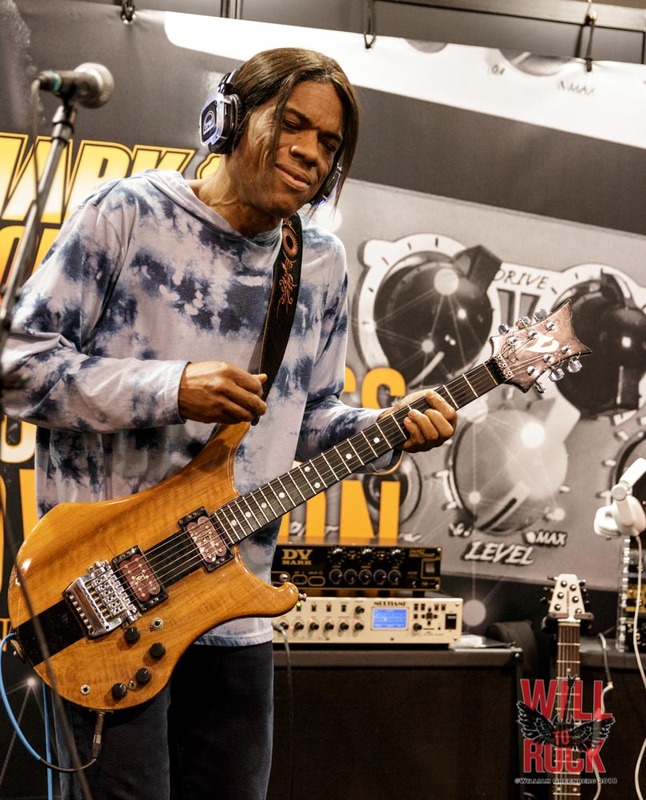 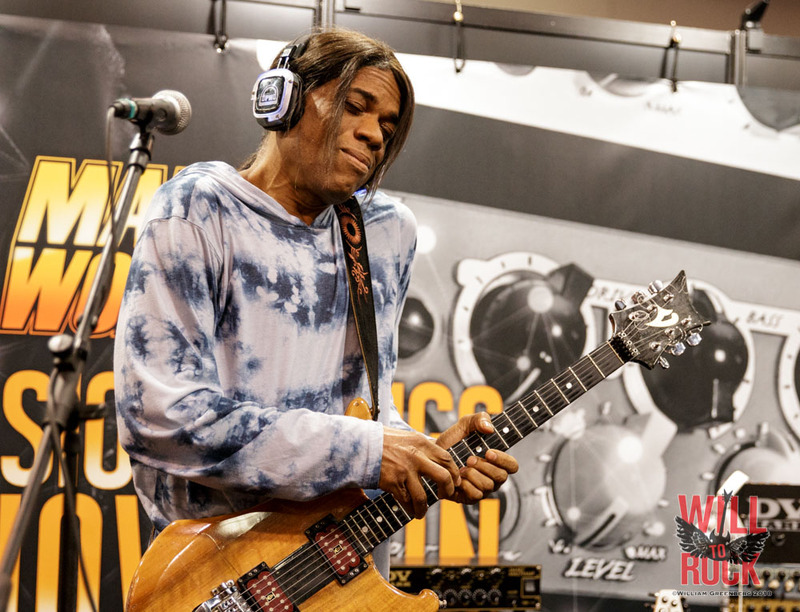 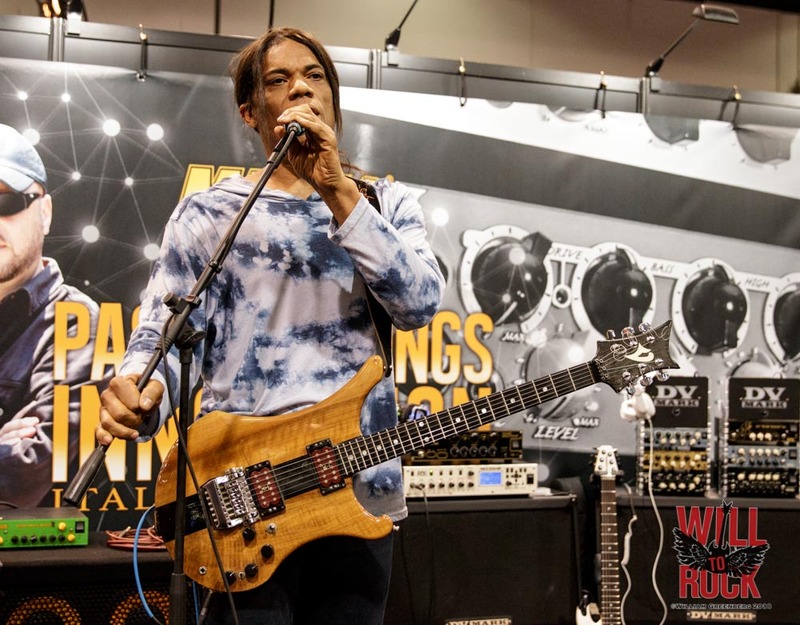 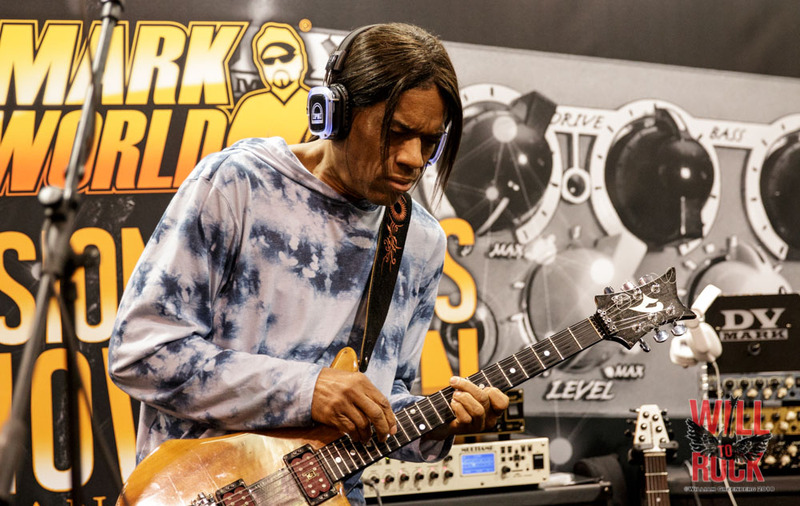 Jazz Guitarist, Stanley Jordan, gave an incredible demonstration at the DV Mark amps booth. 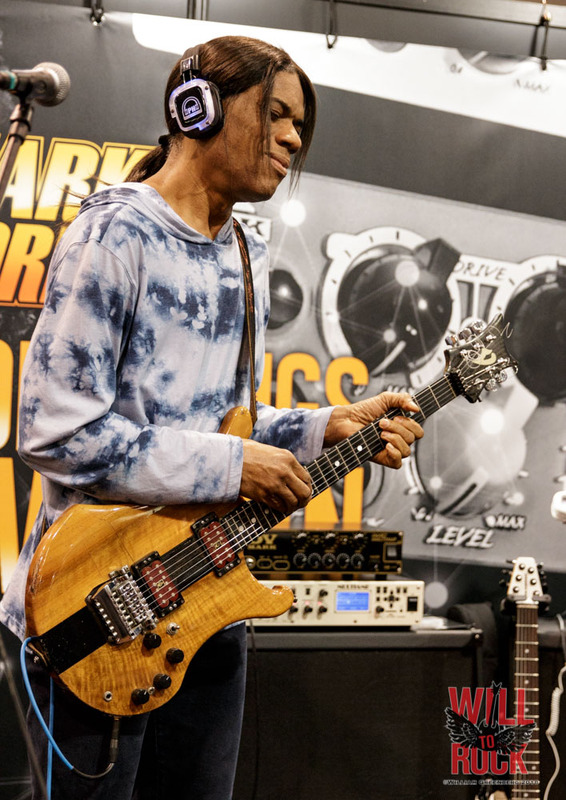 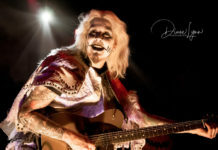 His signature fretboard tapping style was incredible to watch from a few feet away, while listening on headphones that gave you the opportunity to isolate his guitar from all the peripheral NAMM noise. 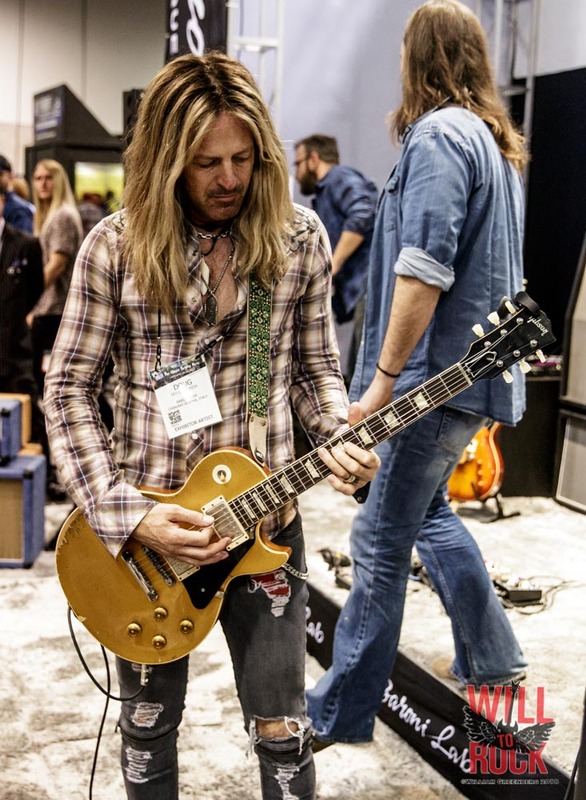 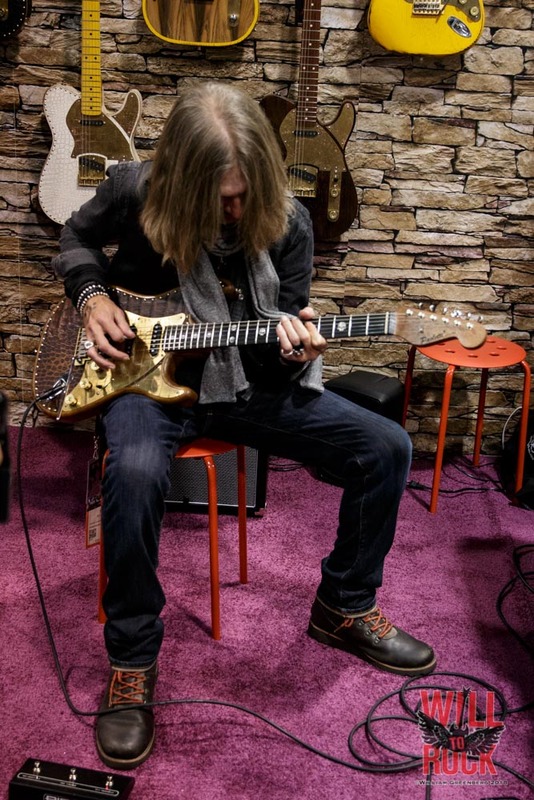 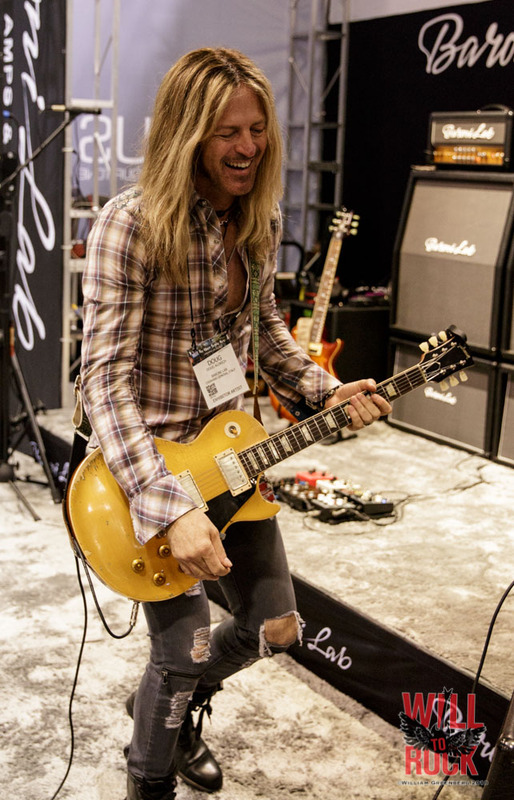 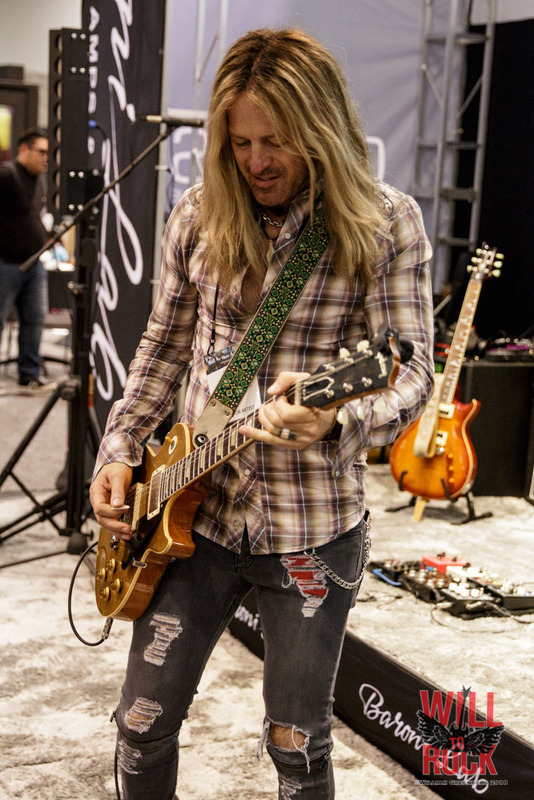 Doug Aldrich (The Dead Daisies, Whitesnake) spent some of his time crankin’ out riffs at the Baroni Lab. 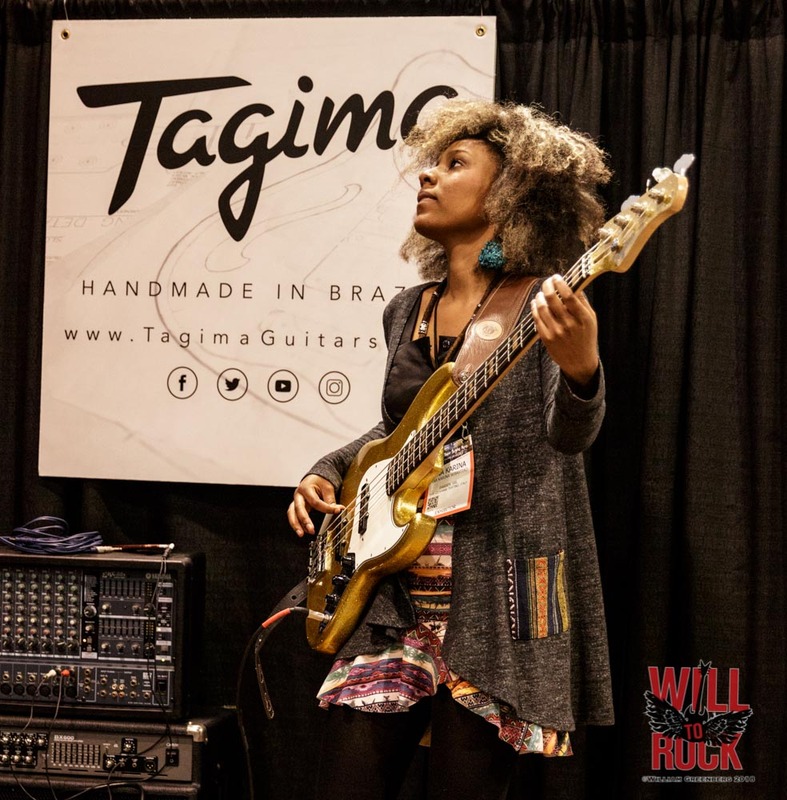 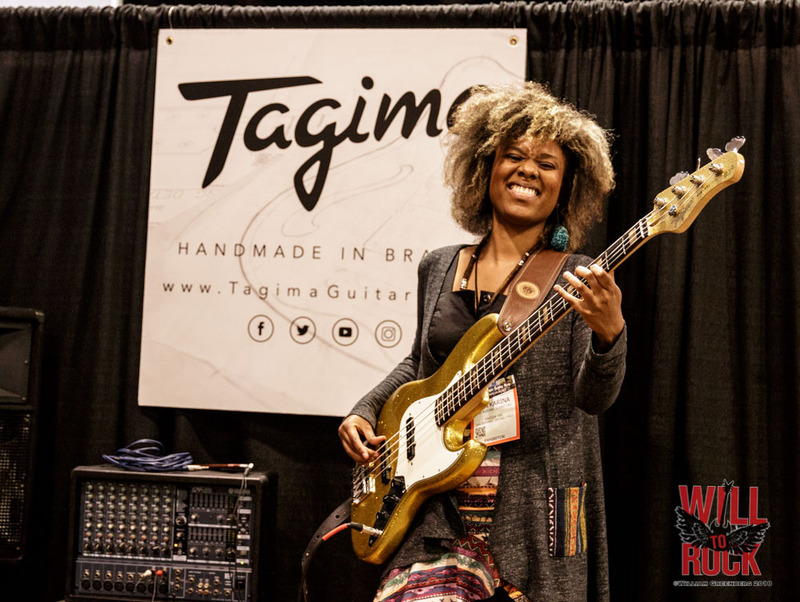 Brazilian Bassist, Ana Karina Sebastiãoo, jamming on the Brazilian made Tagima bass. 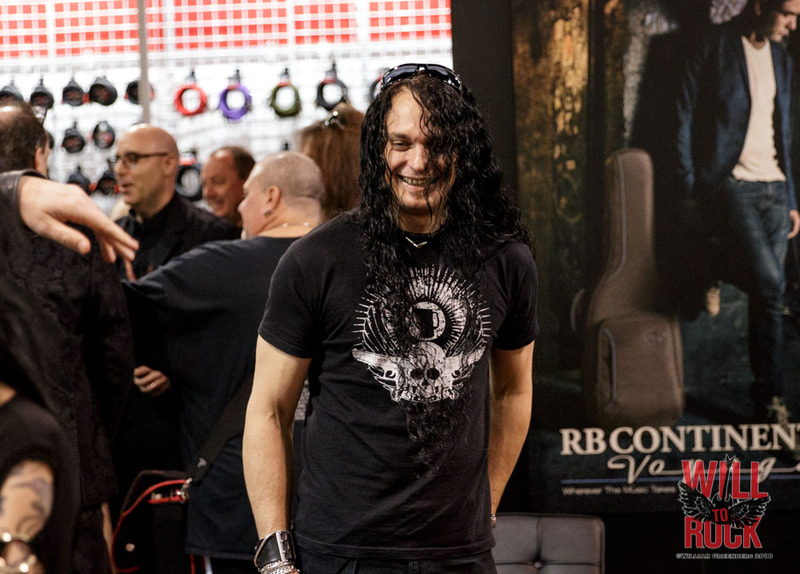 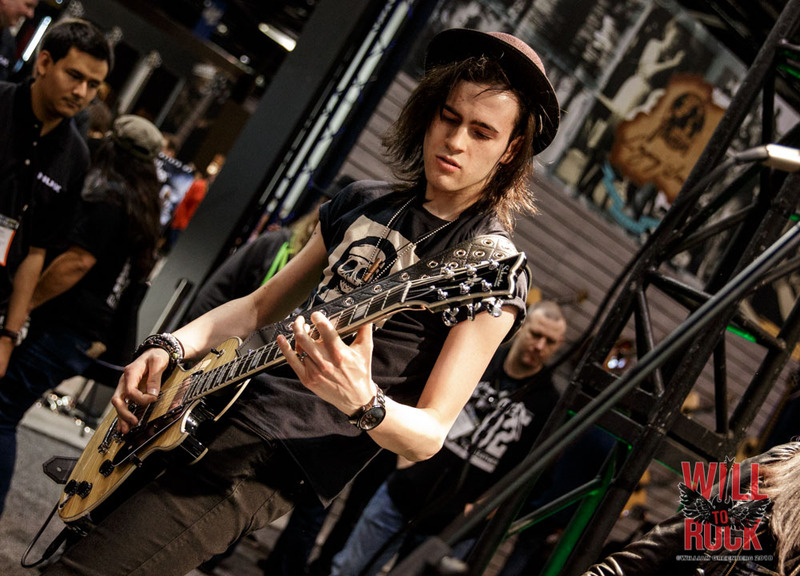 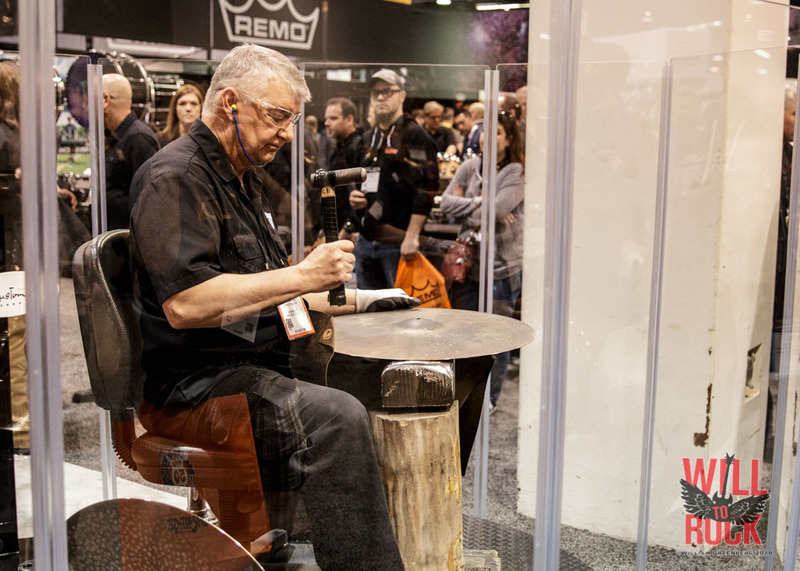 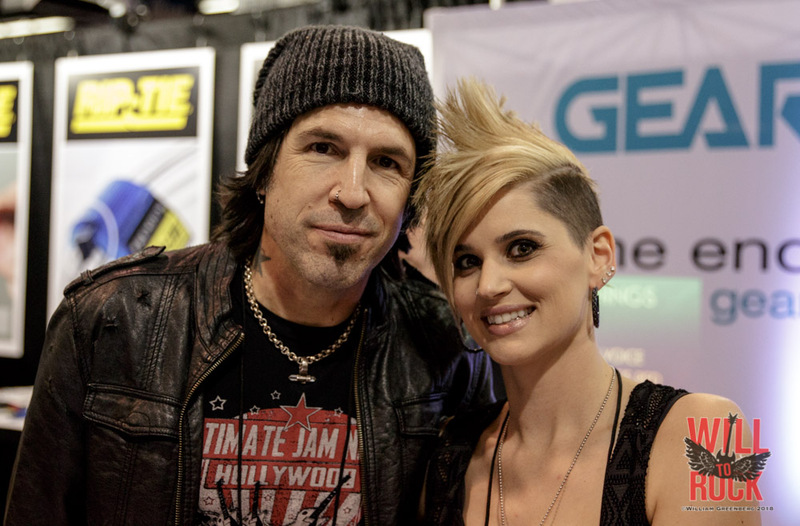 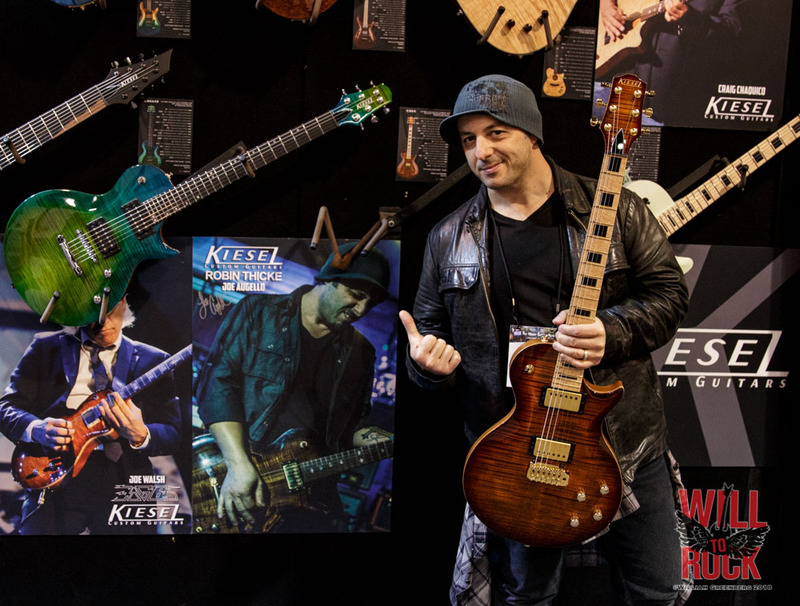 Joe Augello (Robin Thicke) at the Kiesel Booth. 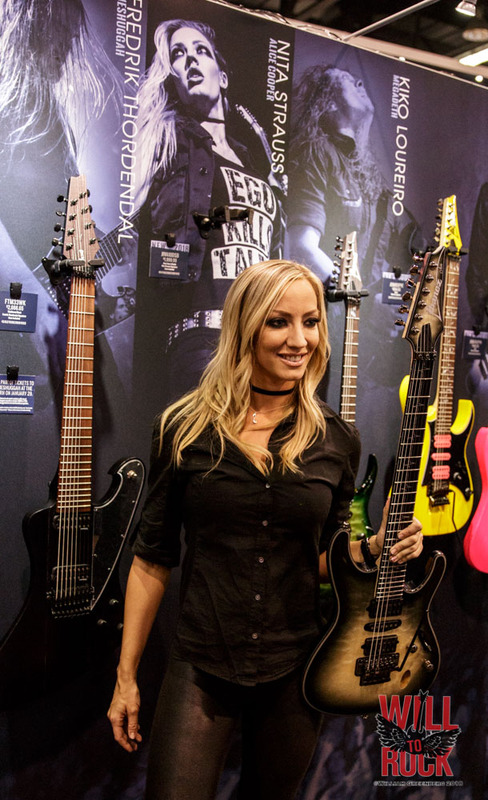 Nita Strauss (Alice Cooper) displaying her signature Ibanez guitar. 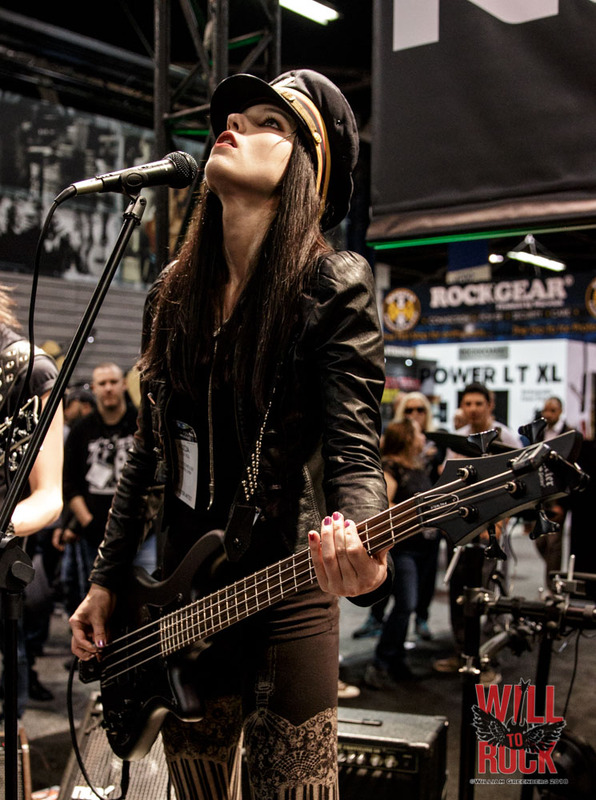 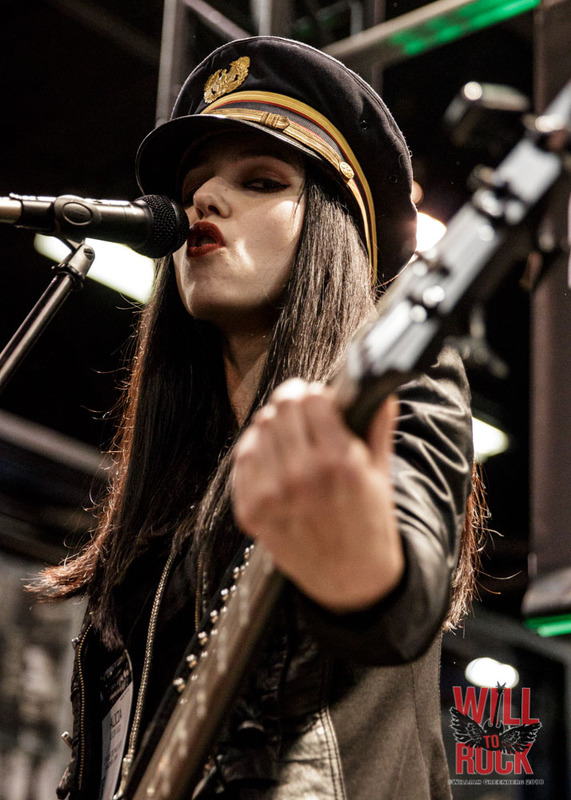 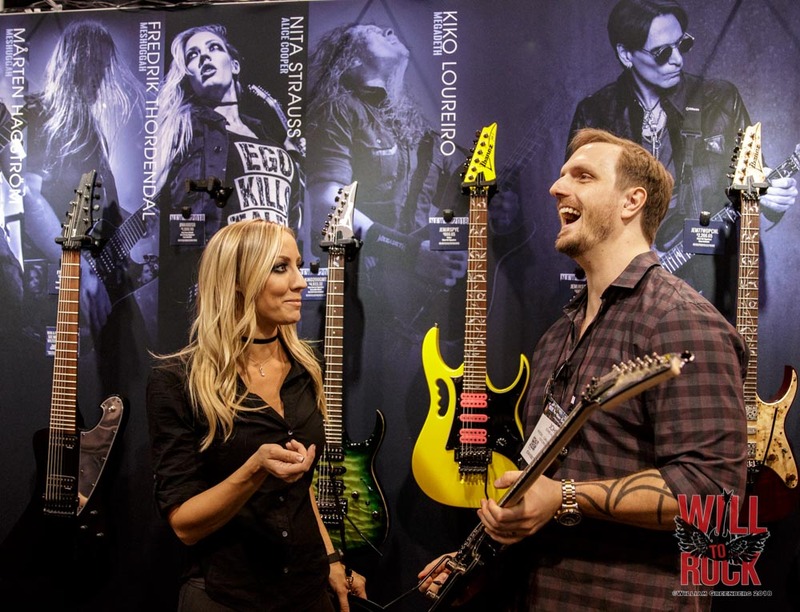 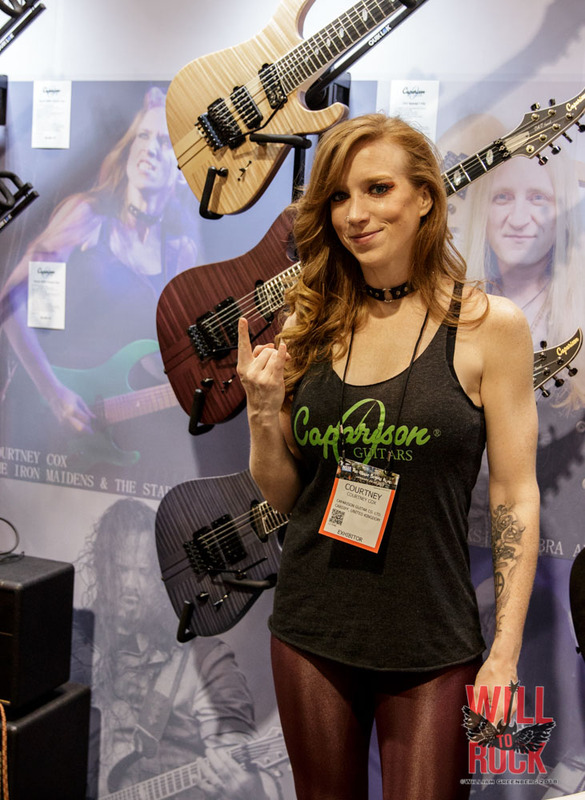 Courtney Cox (The Starbreakers, The Iron Maidens) at the Caparison guitars exhibit. 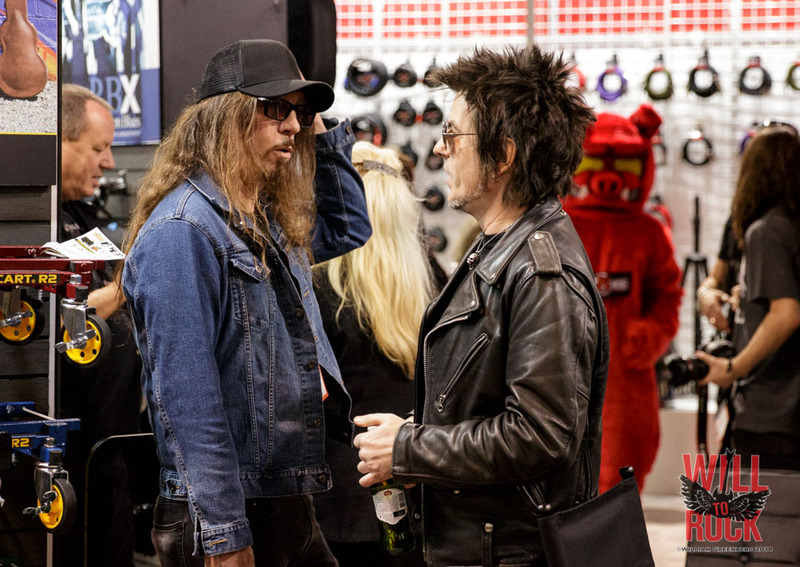 And if the stimulation of all the crash, bangs and wallops was too much….there was time to stand in line and meet some of your heroes. 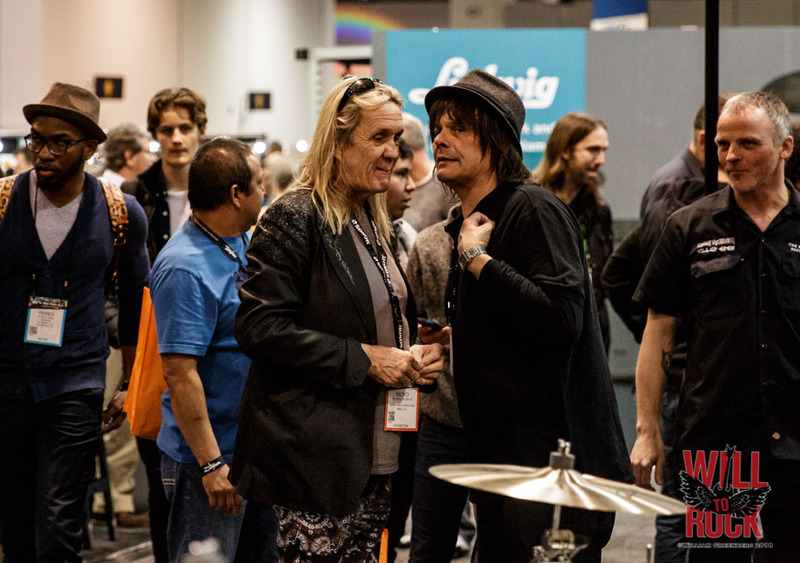 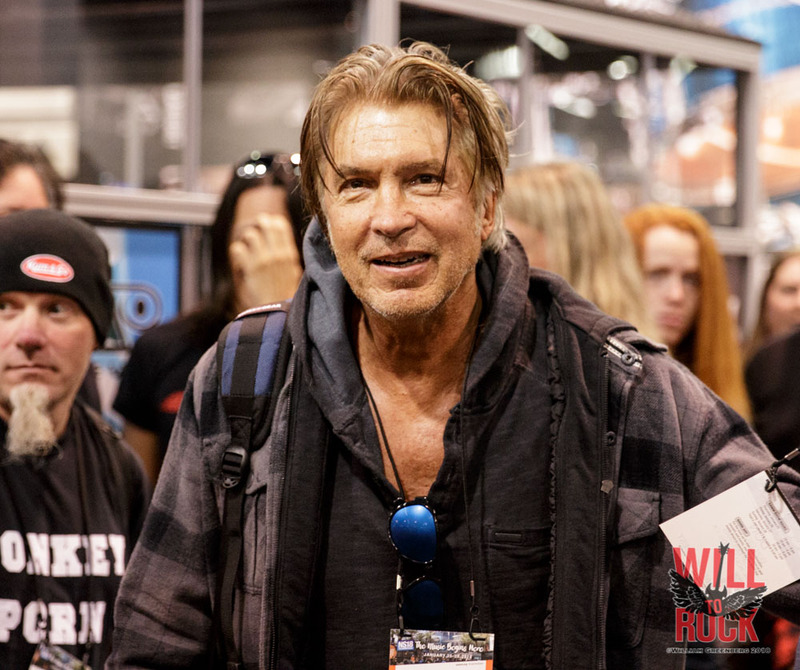 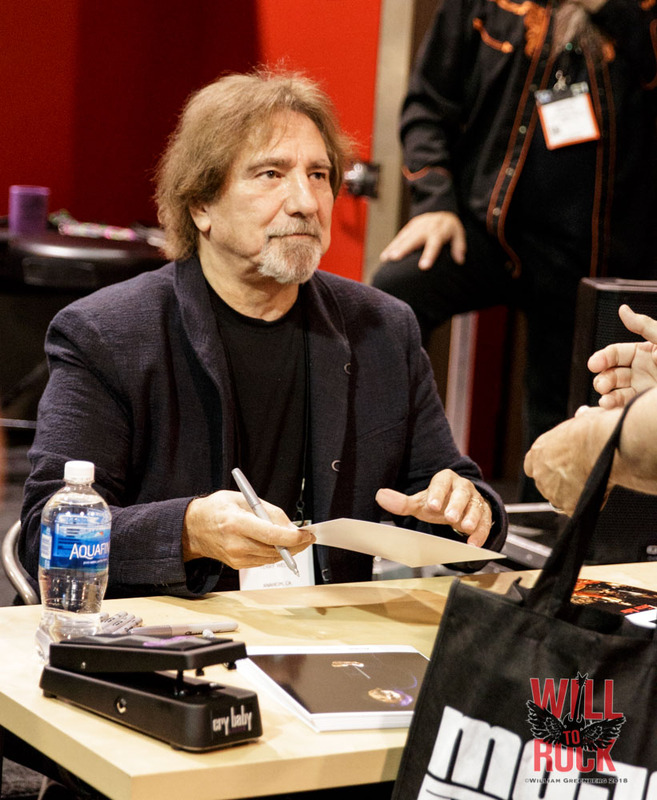 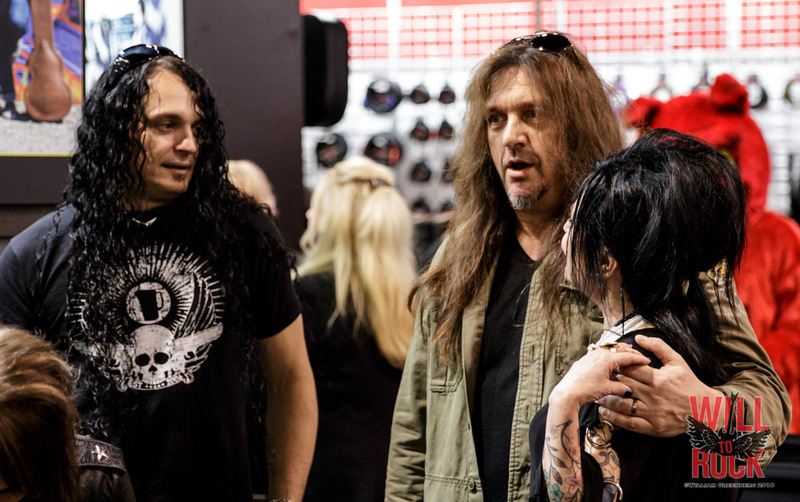 Or you can casually run into music legends just walking around the convention center floor…. 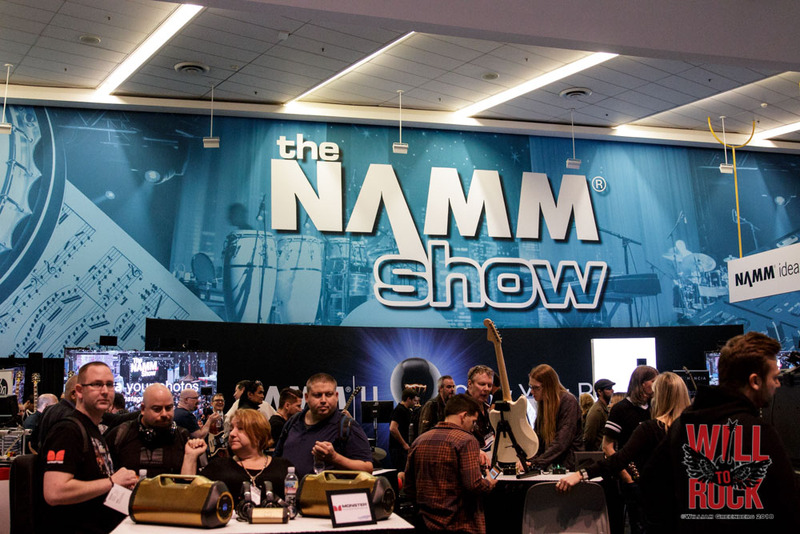 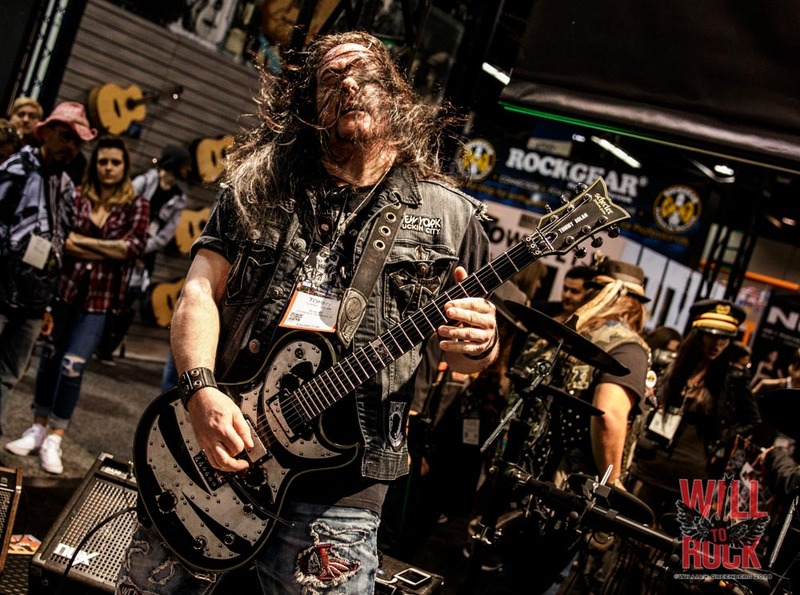 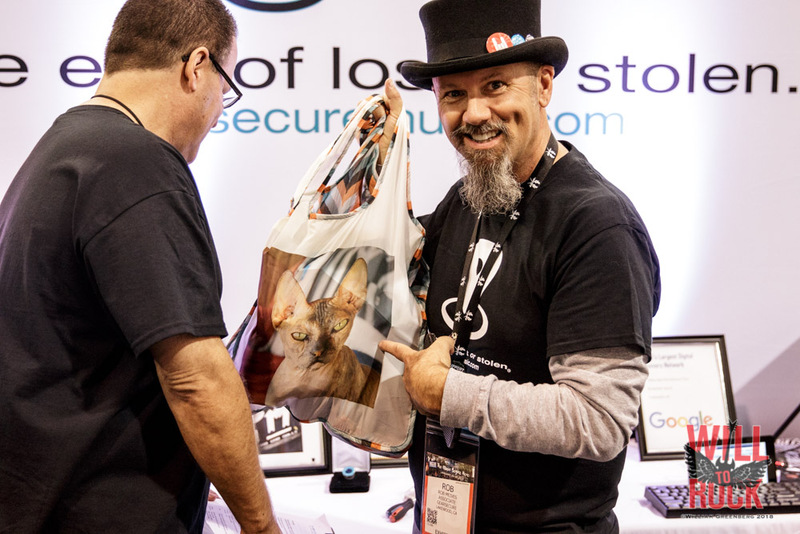 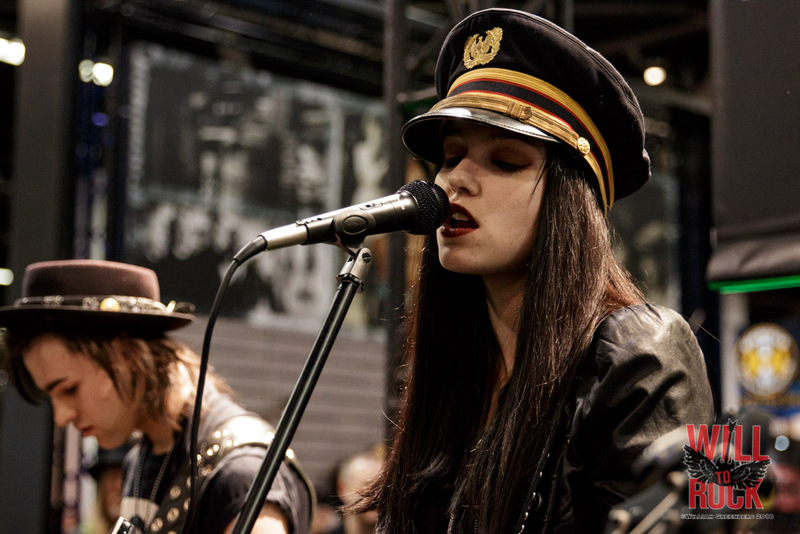 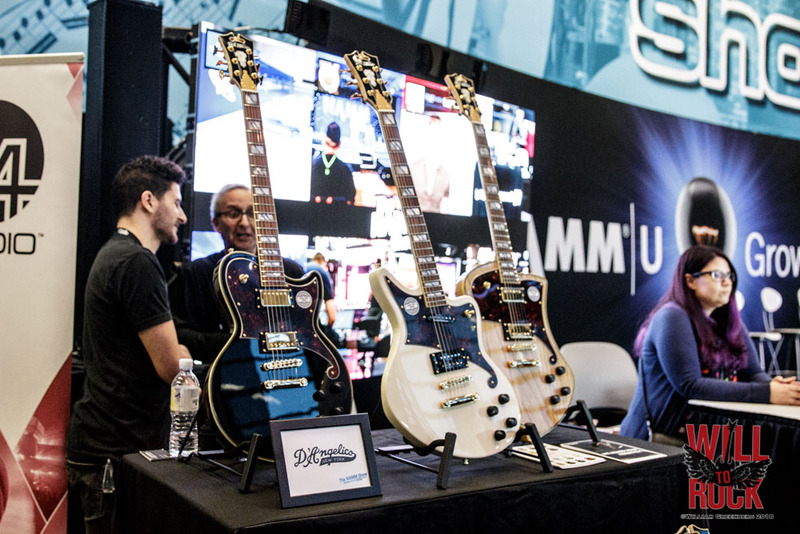 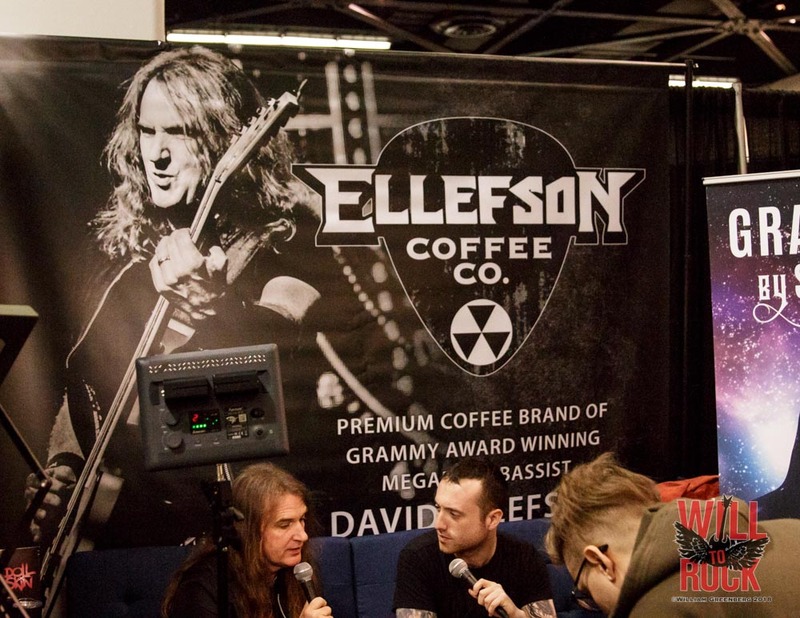 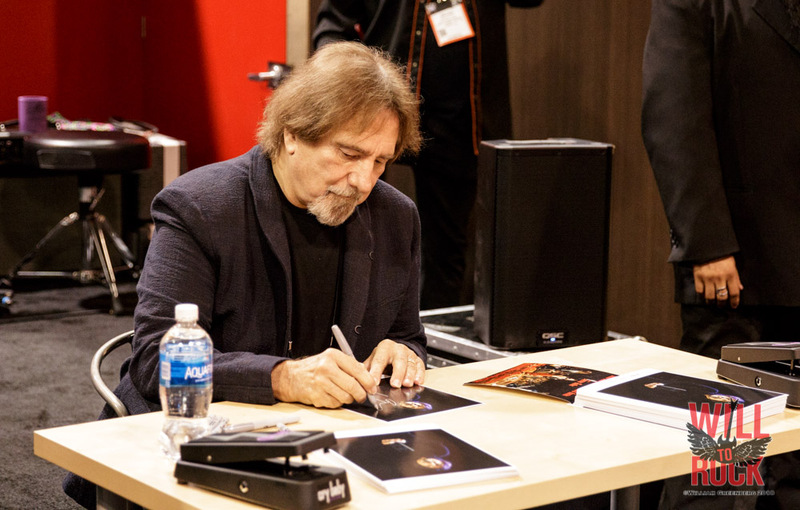 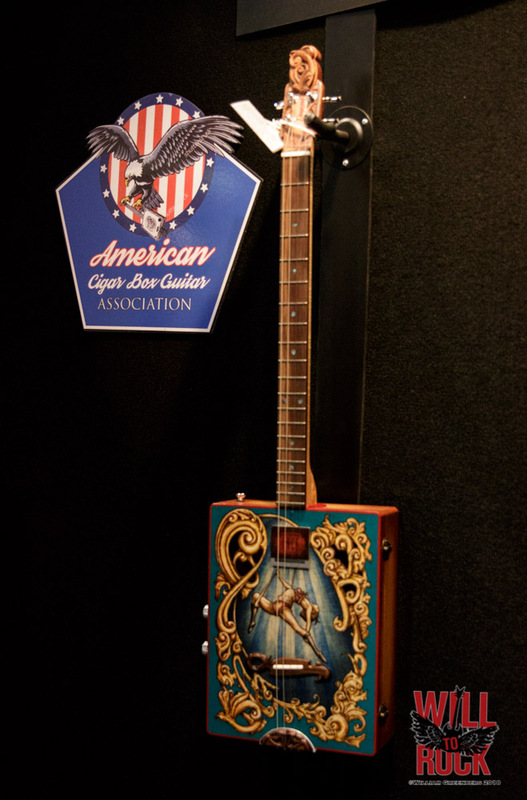 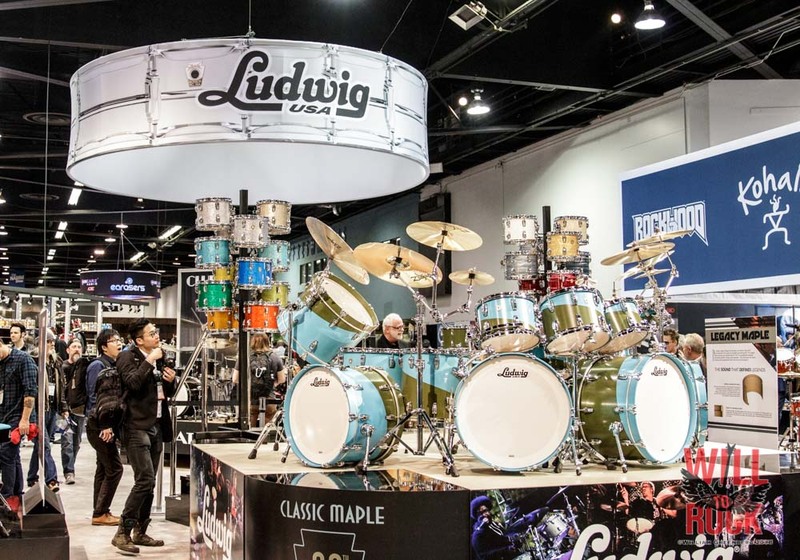 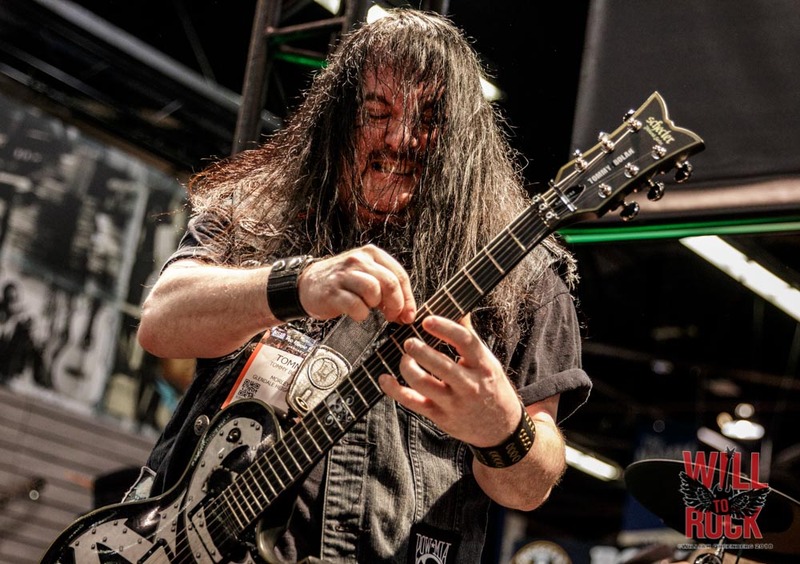 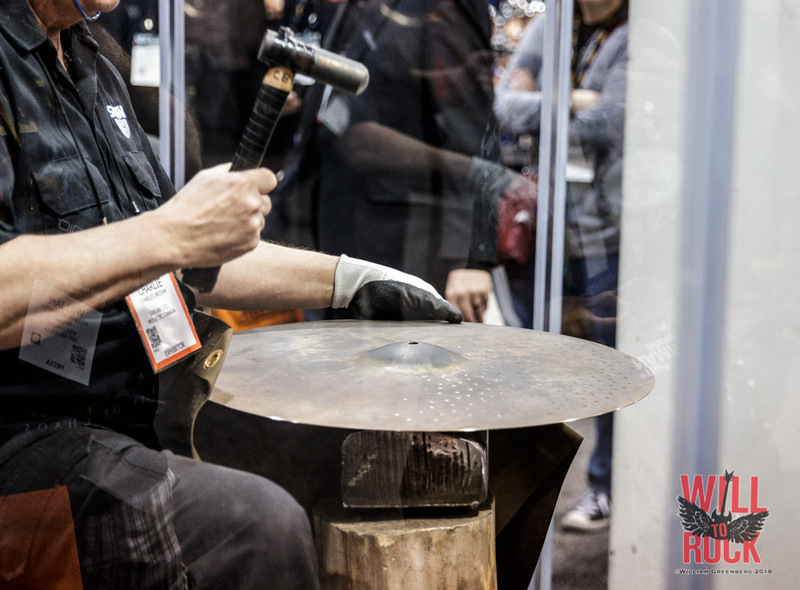 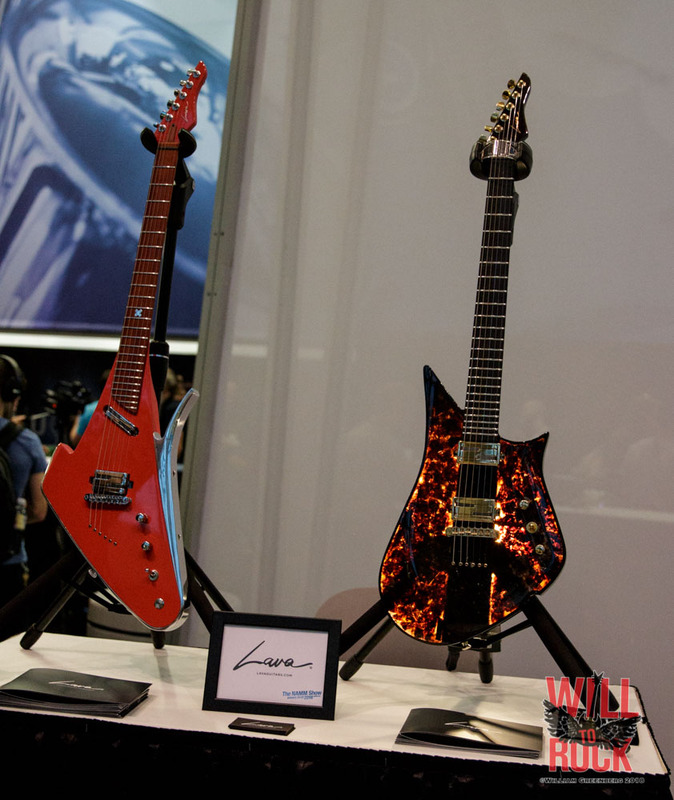 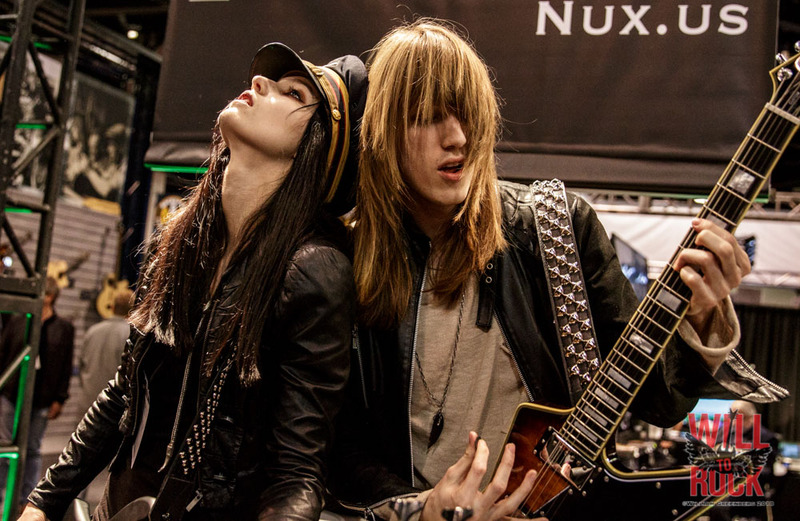 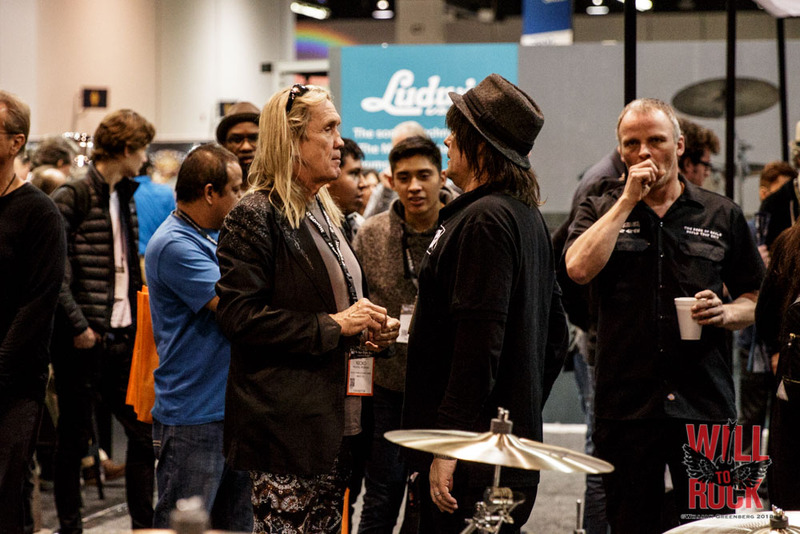 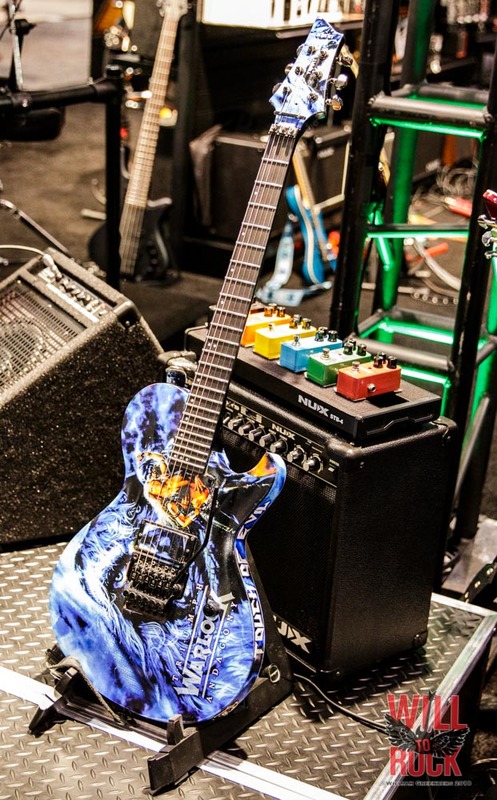 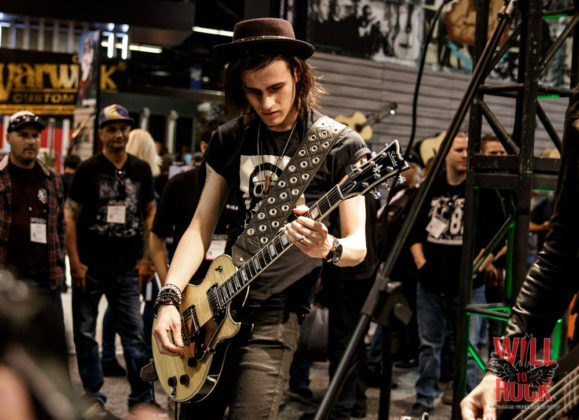 …NAMM is worth all of it! 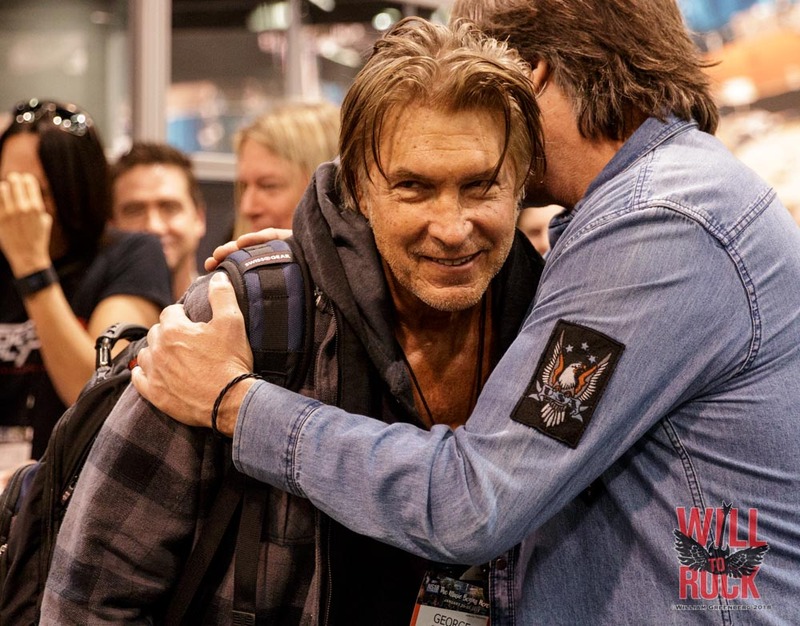 Next articleThe CARL VERHEYEN BAND (Supertramp) – Westlake Village, CA – 1/25/18.